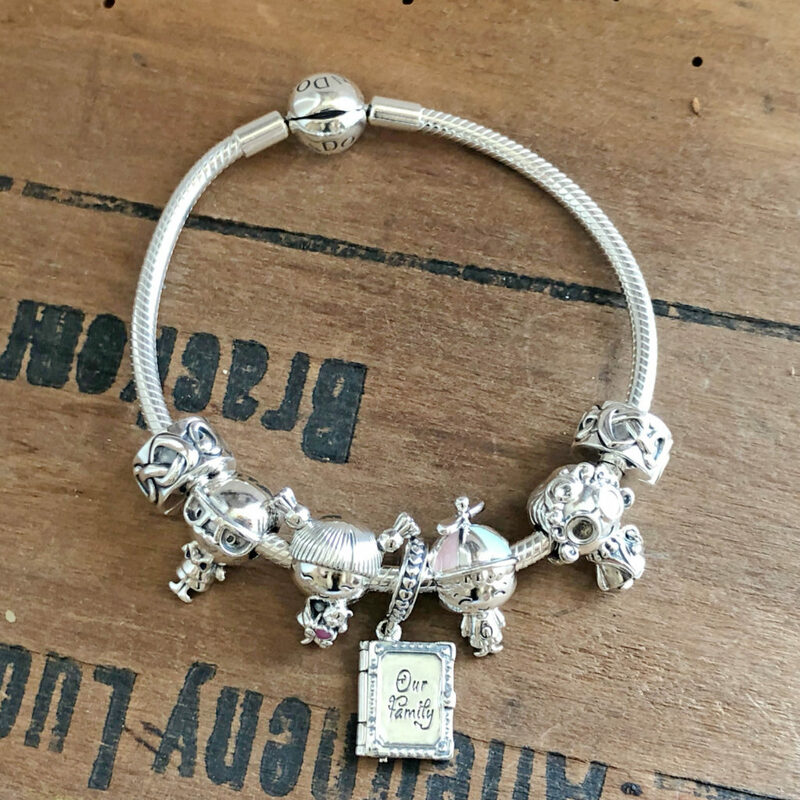 The 2019 Pandora Mother’s Day collection has arrived, and it is filled with beautiful knot motifs, fun new celebration beads, and a whole new family of charms to love! Read on for our full review of the new pieces below. The Pandora Mother’s Day mini-collection includes new pieces in both the jewelry and charm selections. 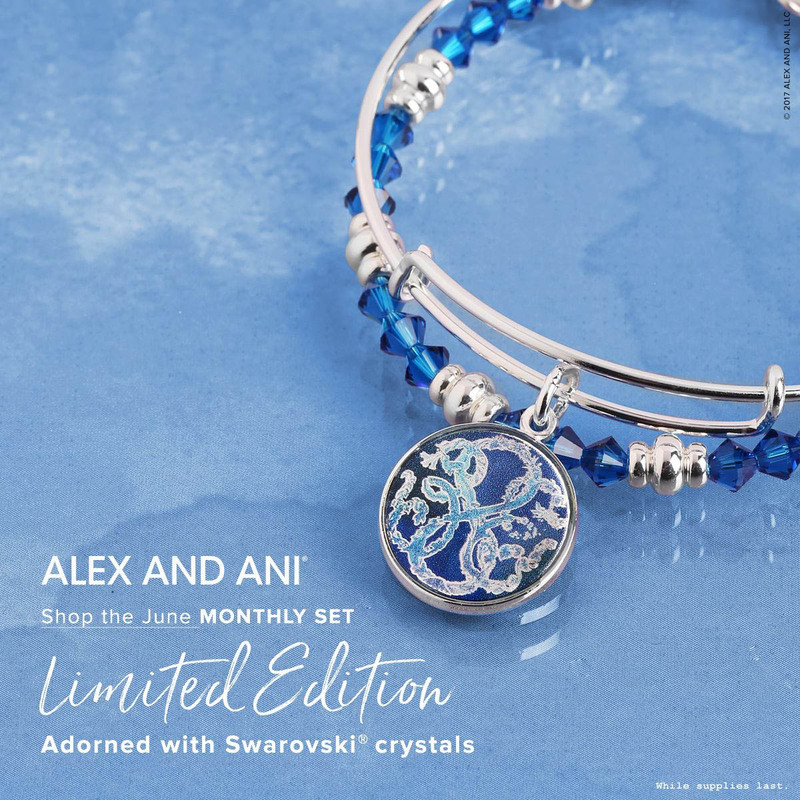 The collection focuses on three main themes, Knotted Hearts, the Tree of Life, and the traditional family and mom-related charms associated with Mother’s Day. 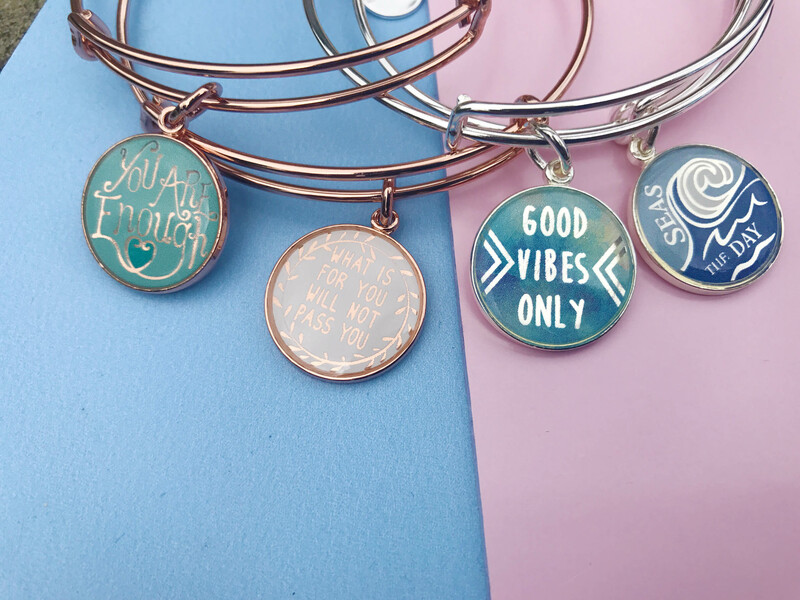 These themes extend to the three new bracelets that are part of this collection. 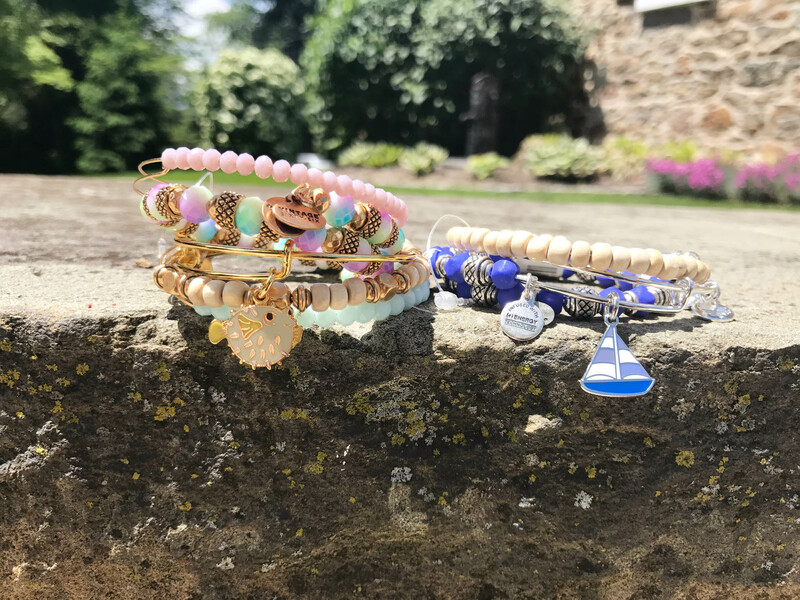 We particularly love the Knotted Heart toggle bracelet- what a beautiful way to show mom how much you appreciate the bond between you! 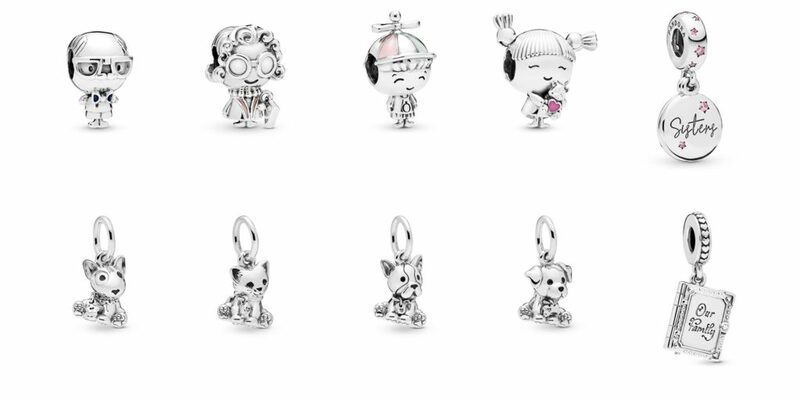 This year’s collection also adds some adorable new members to the Pandora charm family! In addition to the new boy and girl, an older man and woman and a group of new pets have been released. New Dog and Cat Charms! We love the movable parts of the Wise Family pieces- especially the little boy’s propeller hat and girl’s pigtails! 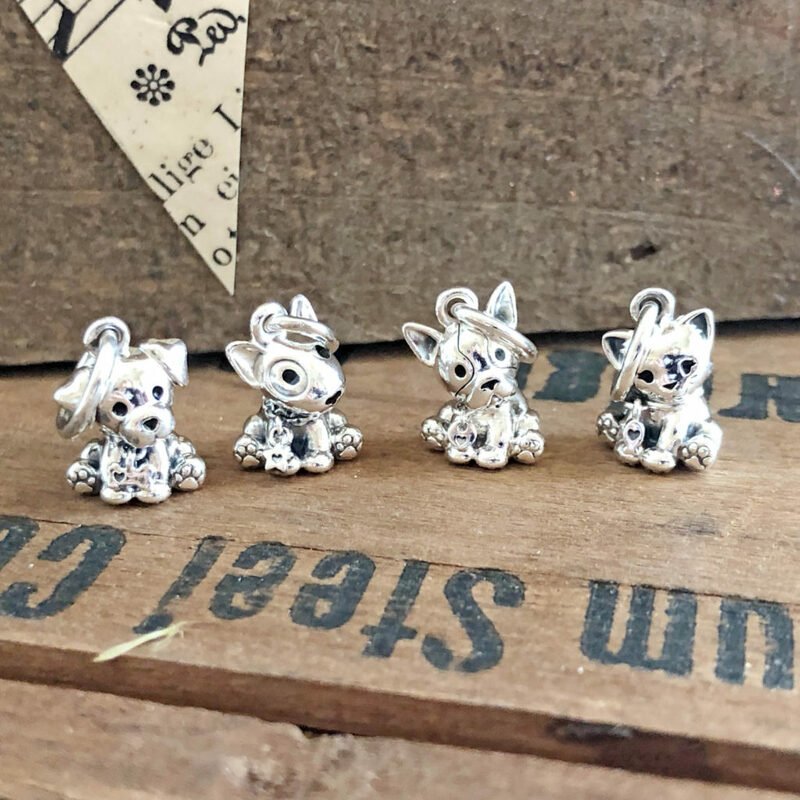 The new dog and cat charms are also some of our favorites- when you are not wearing them on your bracelet you can add them to a chain to make a cute necklace! 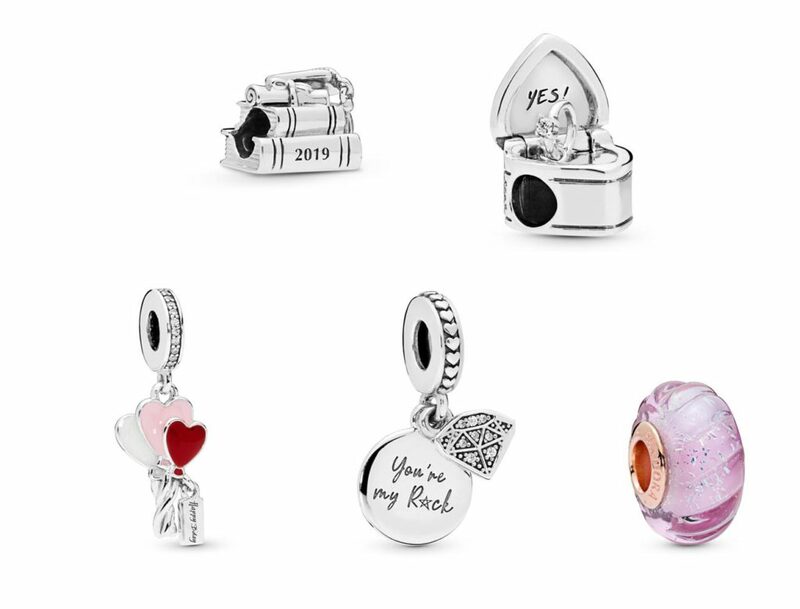 A lot of this year’s mom-themed charms are able to be separated into two charms, celebrating the connectedness between mom and her children. There are also some fun new interactive pieces- the Spinning Tree of Life can be turned around to reveal a message on the back, Mom’s Golden Heart reveals a message when rotated, and the Window Heart charm can be opened to show mom’s name in the night sky. 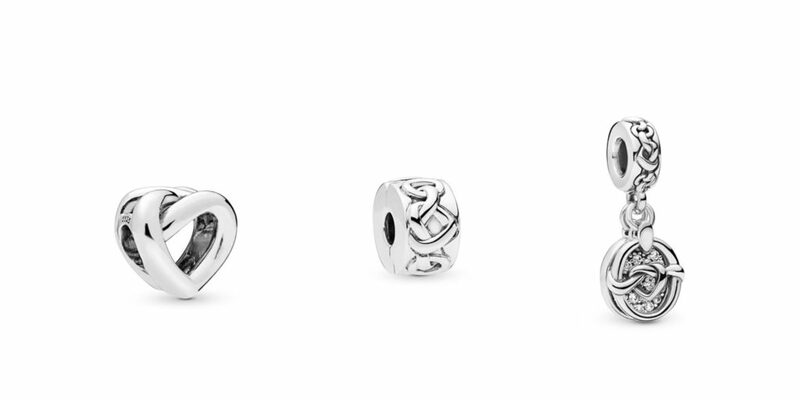 The Knotted Heart theme is represented in three new charms. 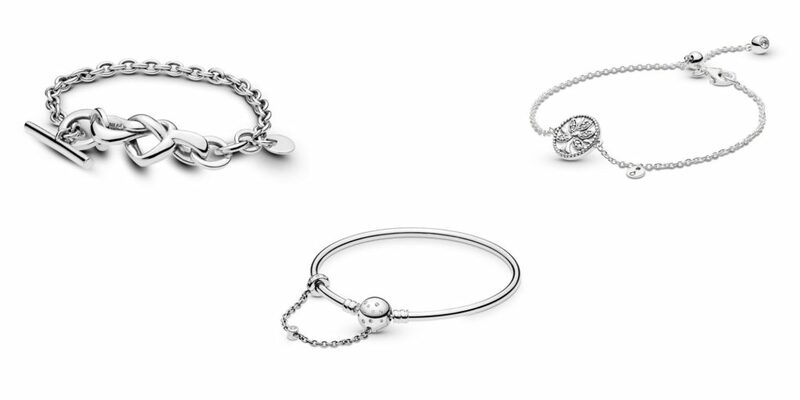 We love the dangling Knotted Heart Charm with its sparkling background; on the reverse is engraved “Joined by Love”. 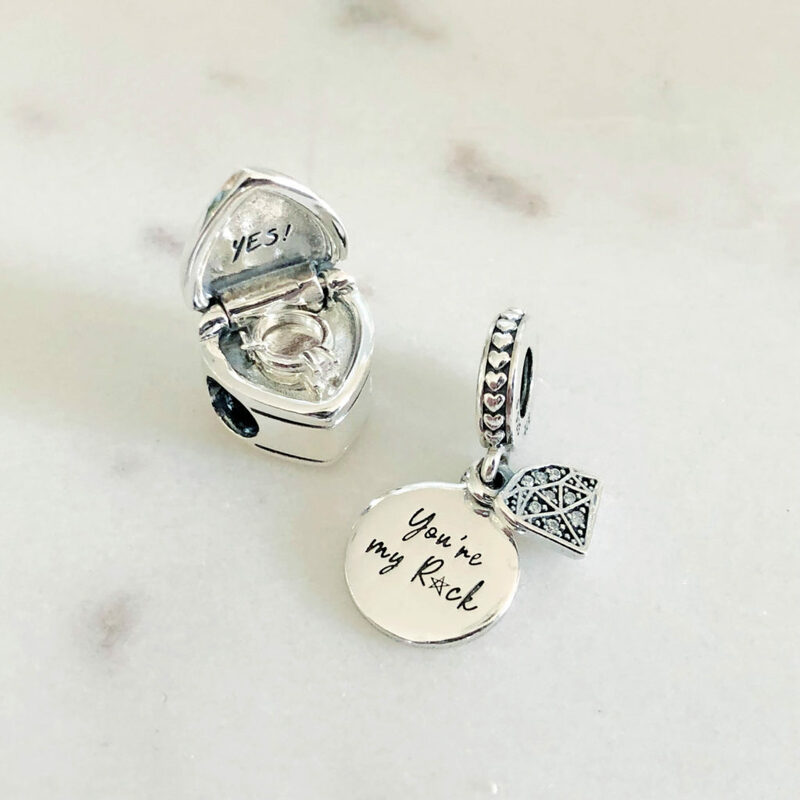 The My Rock charm for the groom-to-be to commemorate an engagement. 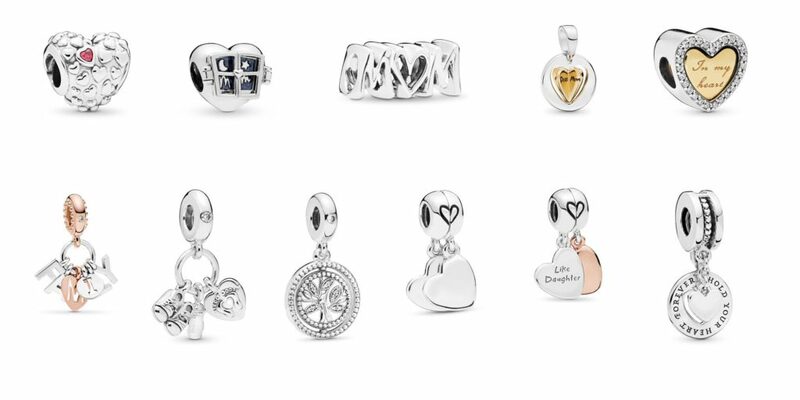 This year’s Mother’s Day collection also includes some new celebration charms for different occasions. 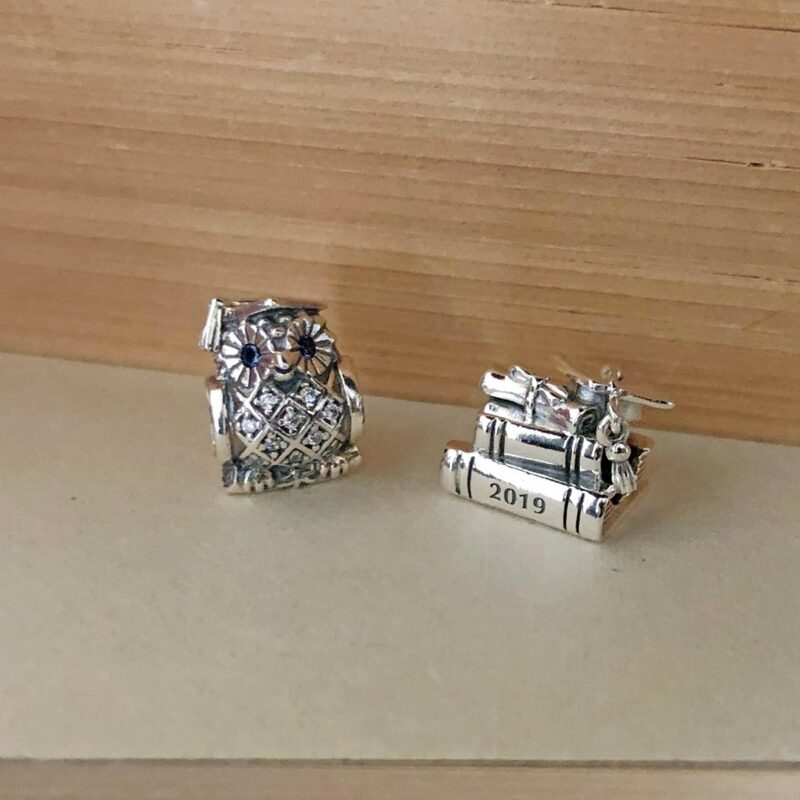 The new 2019 graduation charm, engraved with the year, is one of our favorites- we love the moveable tassel on the graduation cap sitting on top of the books! 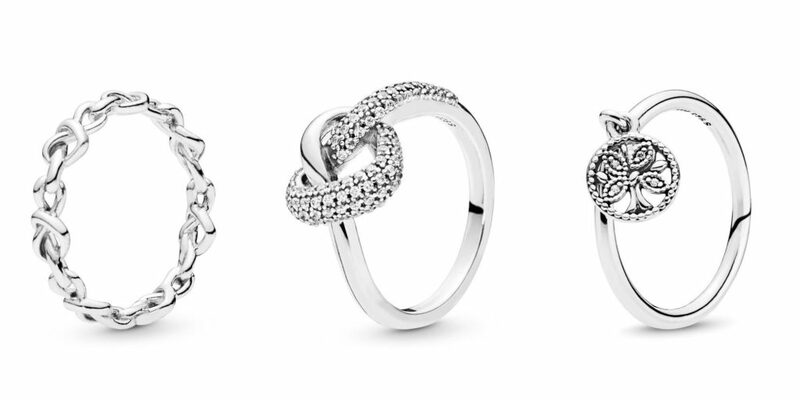 In the new jewelry additions, we think the Knotted Heart pieces really stand out. We love the contrast between the bright silver knot and the sparkling oval. 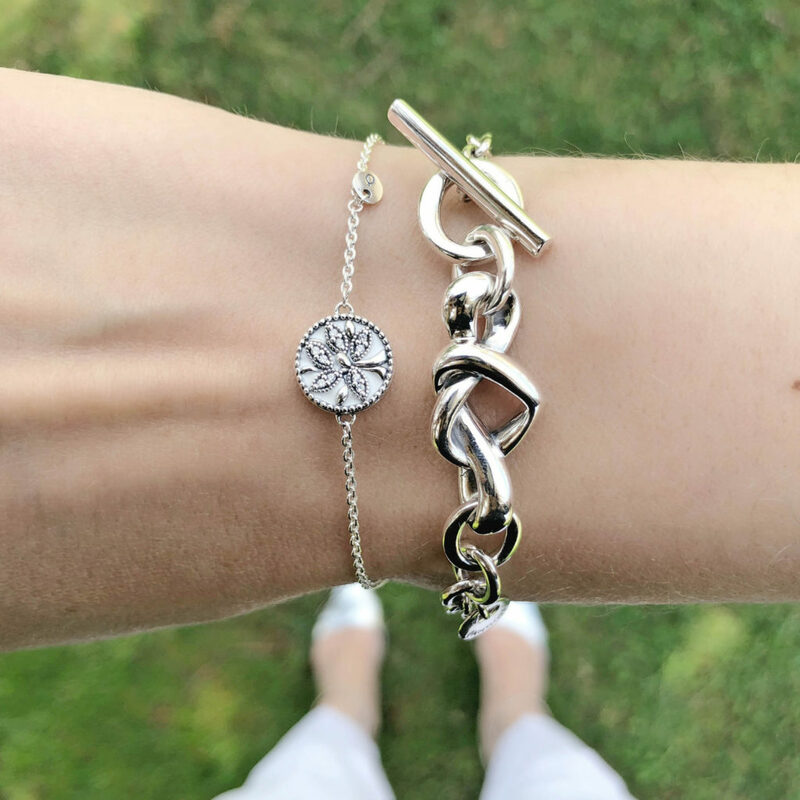 We love the idea of creating a layered look with the new Knotted Heart toggle bracelet and an open bangle styled with the new knotted heart charm. 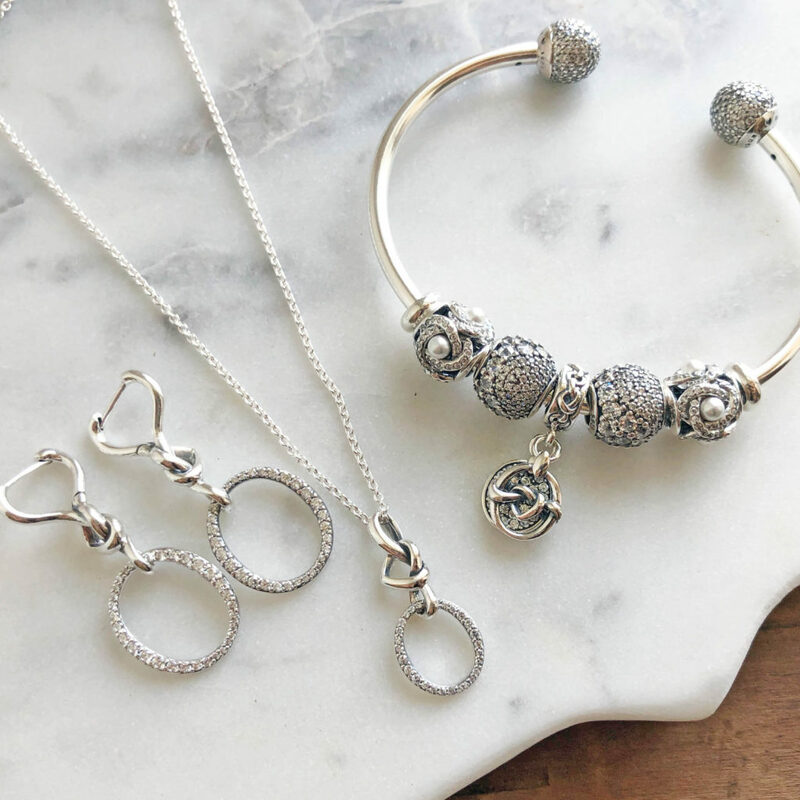 We think these pieces pair really nicely with the older Sparkling Love Knot and Luminous Love Knot designs as well! We also like the new Family Tree necklace. 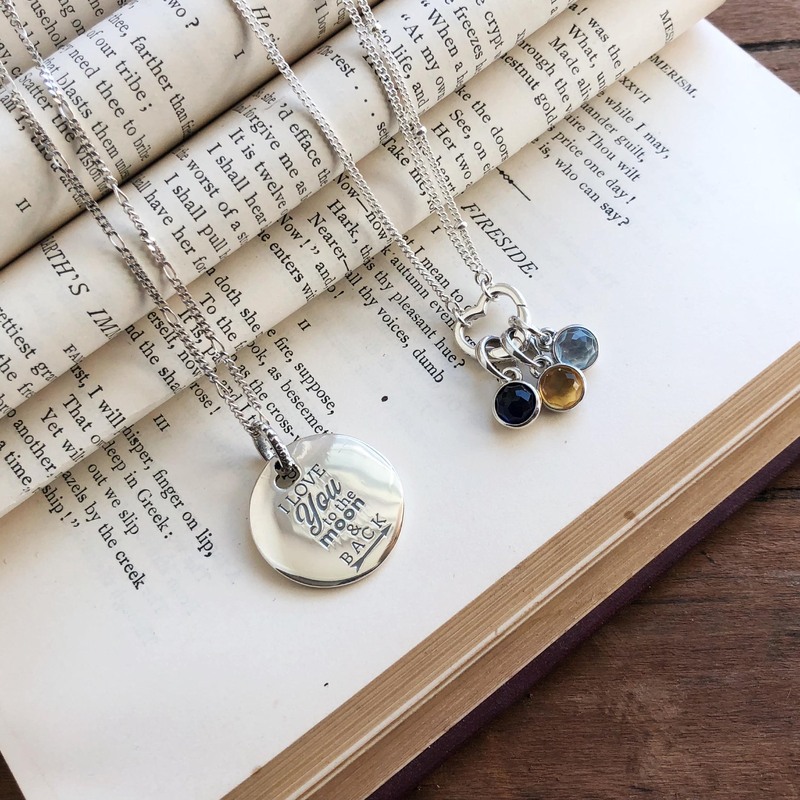 A more petite version of the statement family tree necklace, this adjustable-length design is beautiful for everyday wear. The new Layered Heart necklace is also a real treat- it gives the look of two layered necklaces with one clasp! Other new jewelry pieces include a stud version of the Knotted Heart, stackable and statement versions of the Knotted Heart as a ring, and Family Tree studs and dangle ring. We hope our overview of the new Pandora Mother’s Day collection helped give you some great ideas for mom’s big day this year! 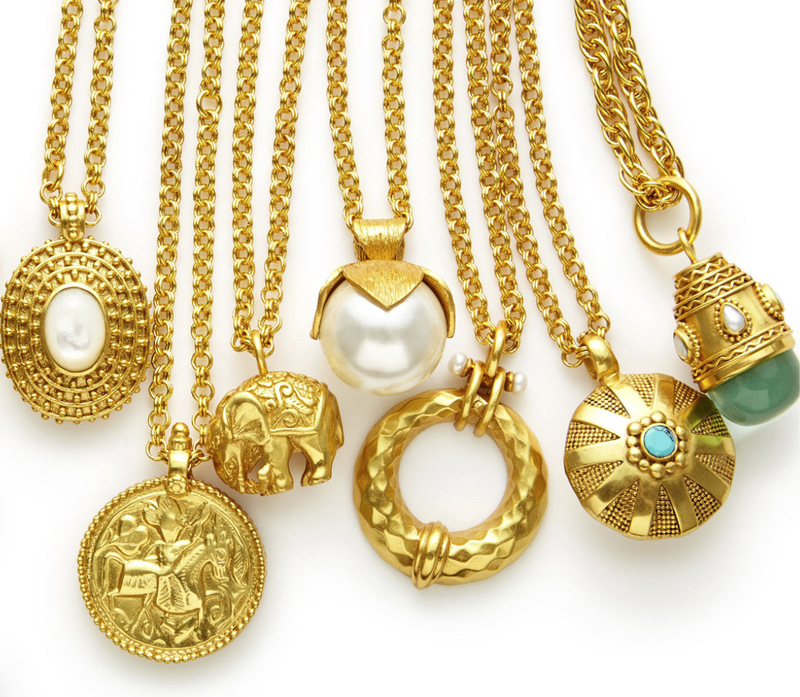 Stop by Versant to see all of these beautiful pieces (and more!) in person. As always, we greatly appreciate all of our customers who make the effort to #shopsmall with us and support our local business. The season of sunshine has arrived! 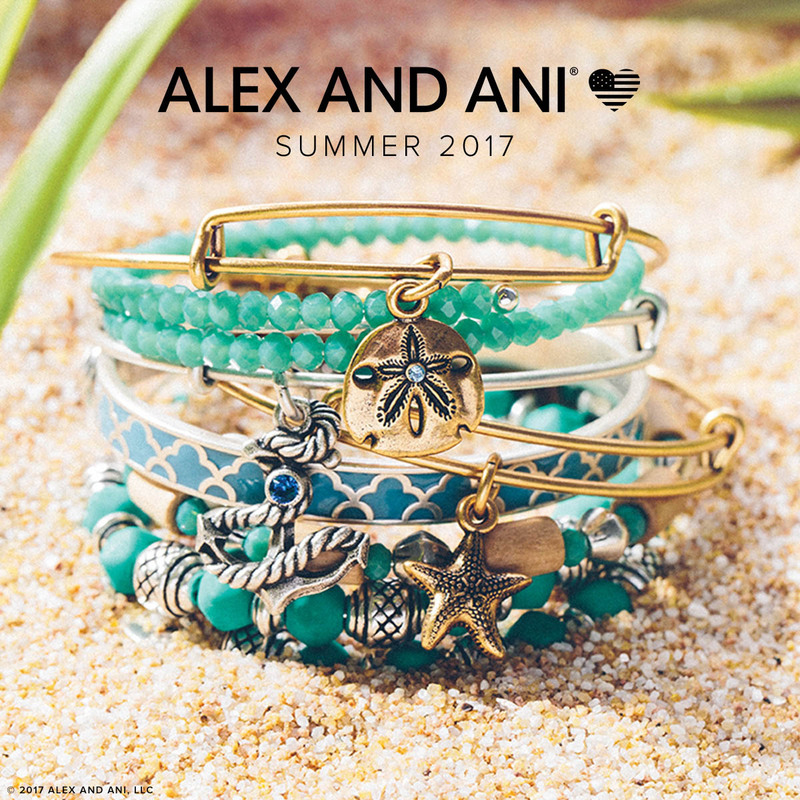 This year’s Pandora Summer mini-collection includes some bright and beautiful new pieces to celebrate the sunny days ahead. 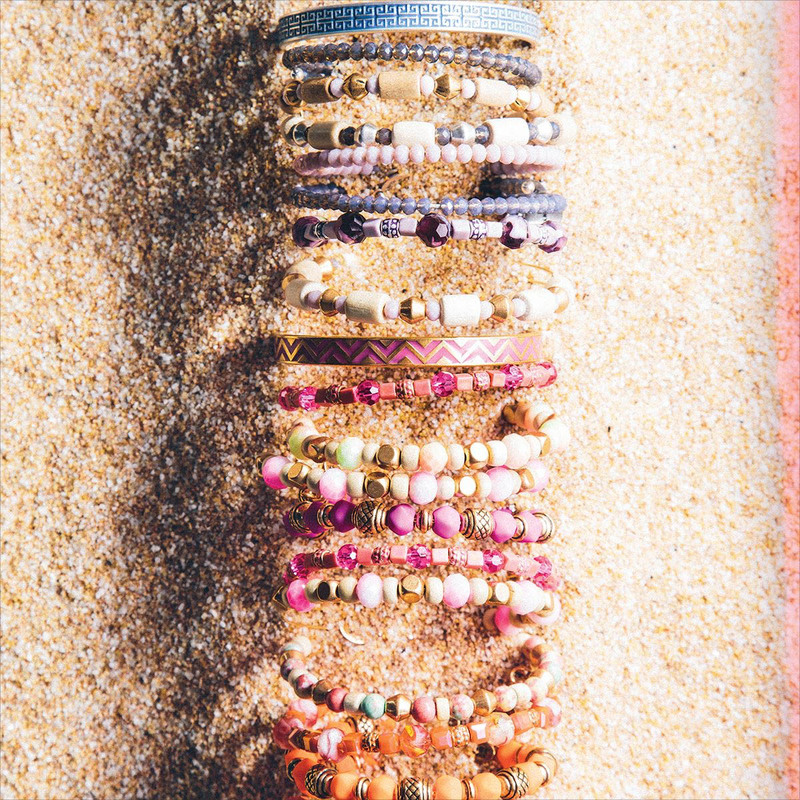 Inspired by summer festivals, this collection is highlighted by trendy feathers, bright colors, and lots of layers. 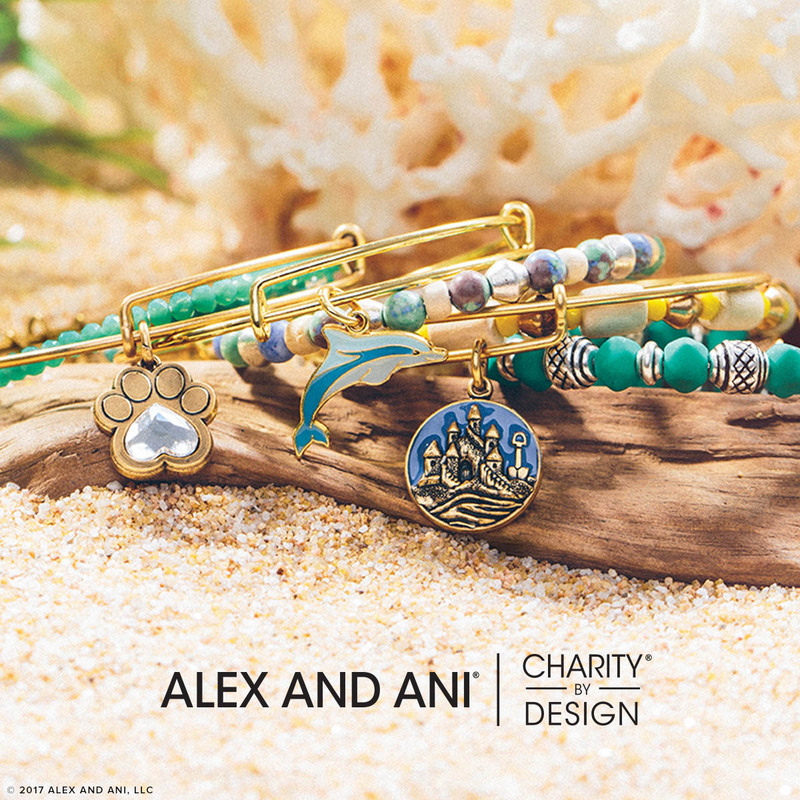 This year’s summer collection charms are a mixture of rainbow hues, bohemian styles, and whimsical designs. 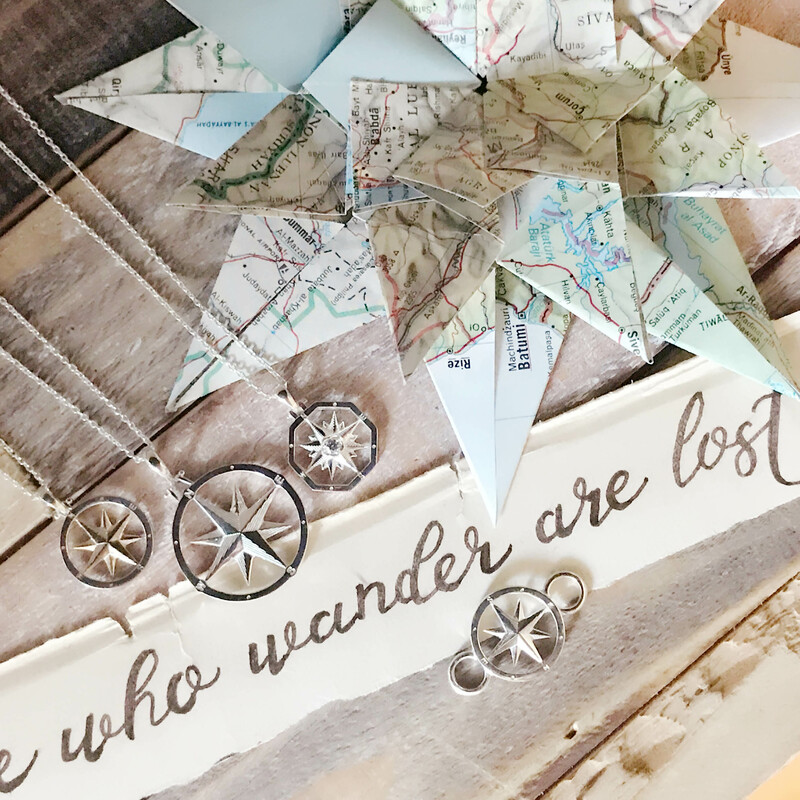 One of the themes of the collection is “Follow Your Dreams,” which is engraved on both the gorgeous new Dreamcatcher and Compass Rose charms. 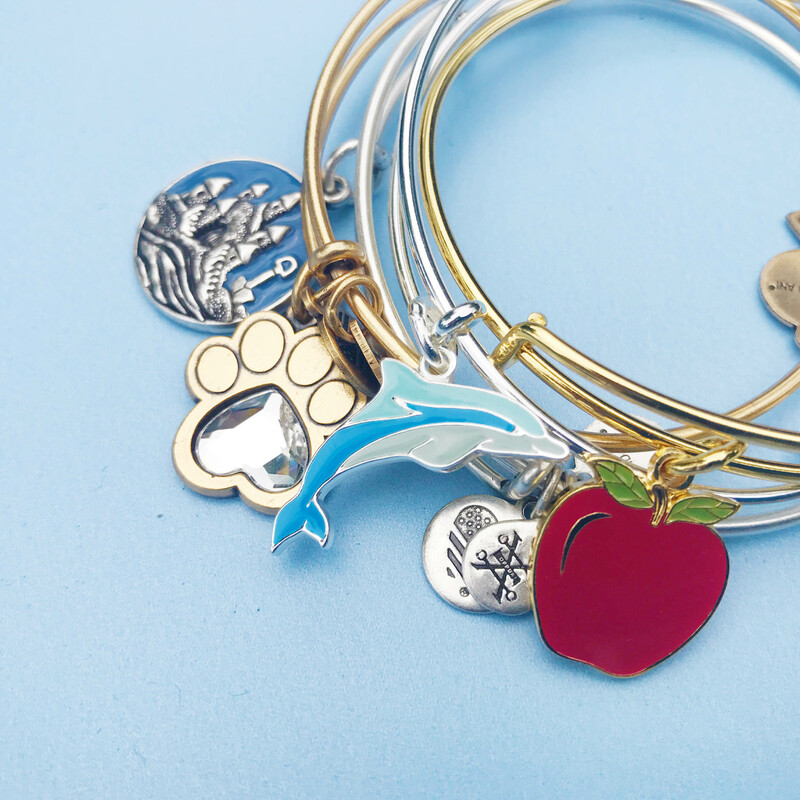 The Dreamcatcher makes a standout choice as a new centerpiece on an open bangle! 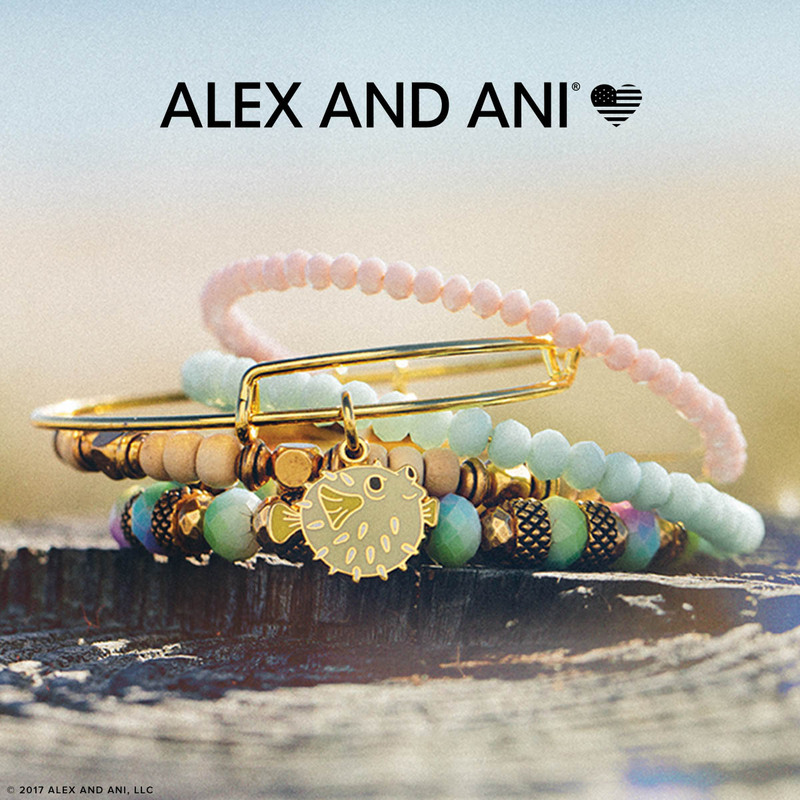 The new mosaic charms feature rainbow enamel with mother of pearl accents. 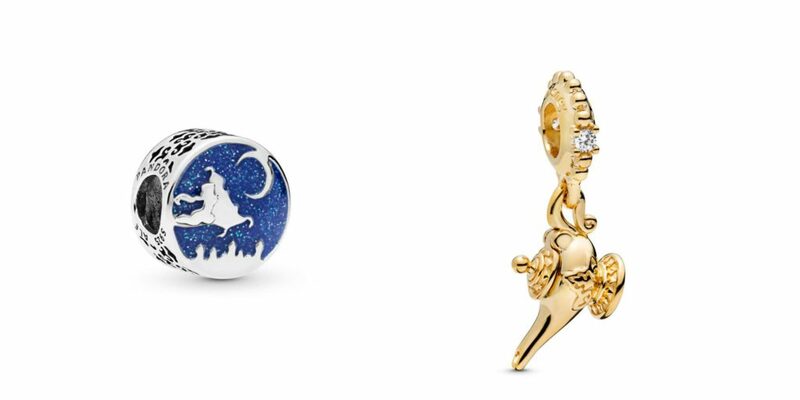 Many of the other charms in the collection center around festival days and boardwalk nights. 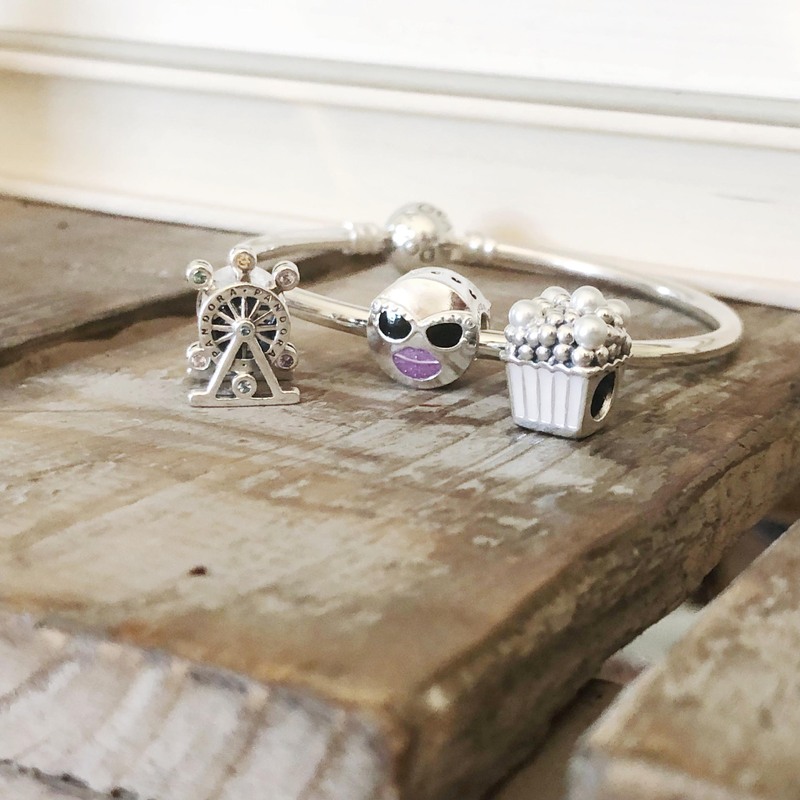 We love the new Pandora ferris wheel and popcorn charms (studded with little pearl kernels!). The sunglasses emoji charm is a great way to express your summertime mood. In addition to the rainbow mosaic, there is a new rainbow heart clip, Radiant Hearts of Pandora charm with rainbow halo, and Love charm with rainbow crystals to help you create a color-filled bracelet. The carved glass heart charm introduced at Valentine’s Day gets two new companions in burnt orange and turquoise blue for a fun pop of bright color. Also featuring the turquoise color is a new heart-shaped silicon clip. 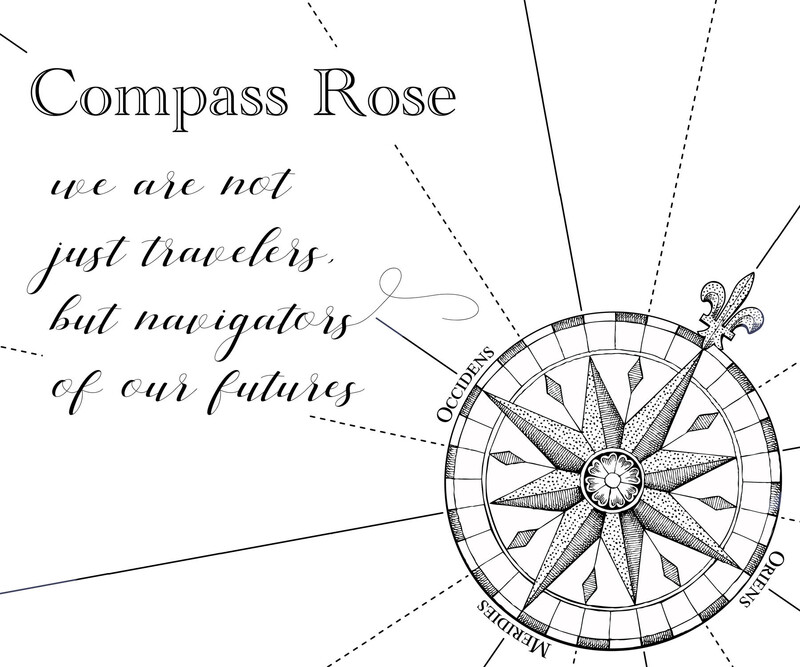 On the more whimsical side are the new peace sign, Compass Rose, and Burger and Fries (inscribed “Best Friends” on the top!). 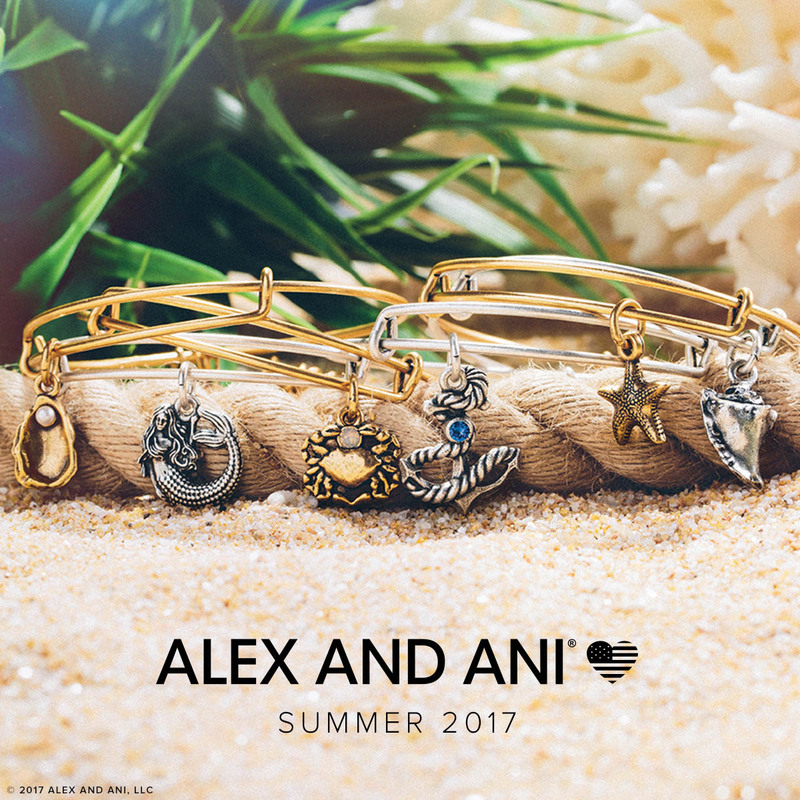 The Pandora Summer collection has added some versatile new bracelet styles in their leather collection. Breaking away from the traditional braided leather design, these feature a smooth leather that lets your charms really stand out. In the new adjustable sliding bracelet, a black and tan leather style has been added. 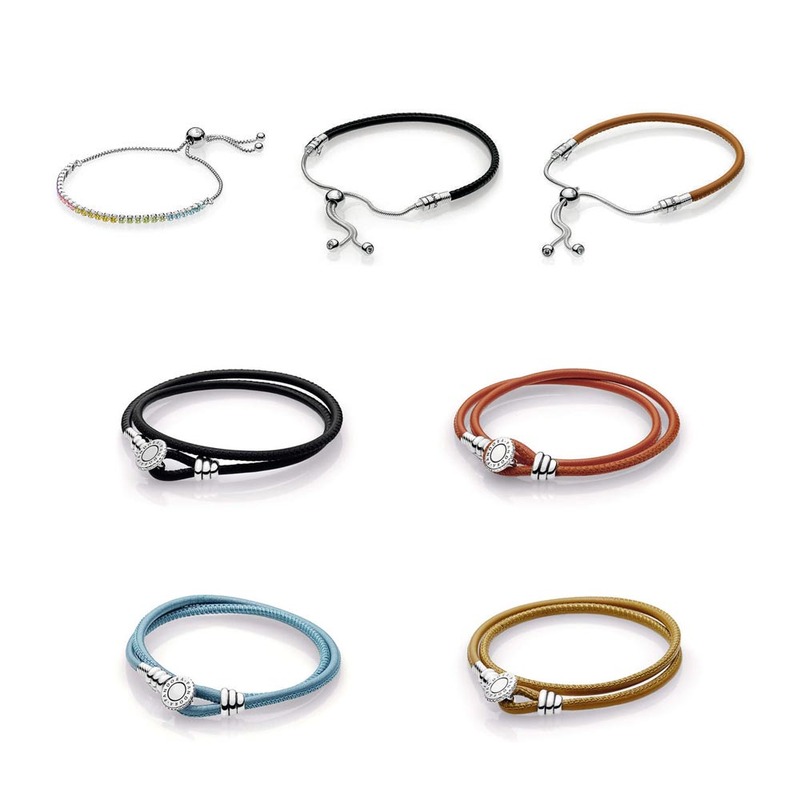 In the seasonal leather bracelets, a fun sterling button accent adds an on-trend look to the double wrap bracelets, available in orange, blue, tan, and black. The sparkling strand has also been updated with a seasonal addition featuring rainbow crystals! Some of the biggest additions to the Pandora Summer collection this year are in the necklace category. Proving that one is never enough, the new necklaces are meant to be layered in different lengths and pendant groupings to get the full festival effect. We love the new adjustable length black and tan chokers. They come with the new feather pendant but can also be worn with any Pandora charm- the Dreamcatcher looks amazing on the choker! The new textured necklace chain is also a great way to show off your unique style. In the engraved collection, an “I Love You to the Moon and Back” disc necklace has been added. For those that like to make a personalized collection of pendants, the new charm-catcher style heart necklace is a fun addition. 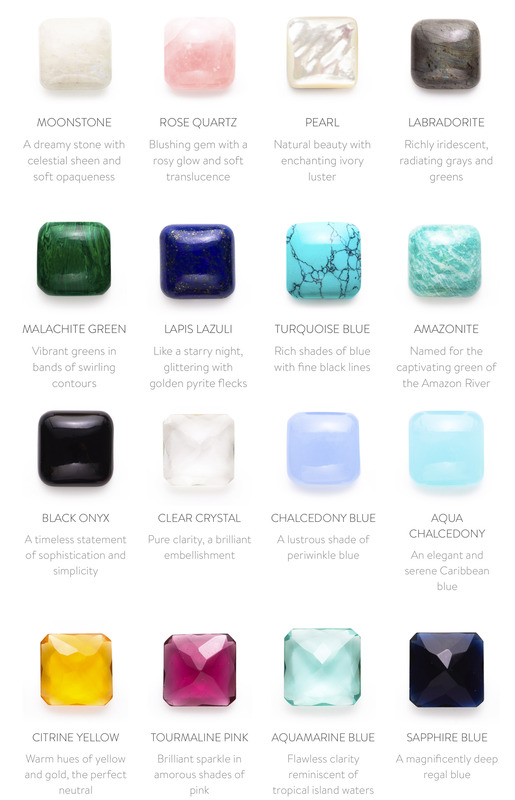 We love the idea of adding a grouping of birthstones to represent your family! In addition to the new chains and chokers, there are a variety of fun pendants that arrived with summer. These pendants look great grouped together in a mix of color and texture. The new fabric tassels, available in turquoise, pink, orange, and black, and horn pendants are a seasonal addition and will only be available through the summer. The Fan of Love pendant, available, in silver and Pandora Rose, is cut to create a wonderful sparkling effect. The feather pendant, which comes with the choker necklace, is also available on its own. Although the earring and ring departments do not have a great number of new additions, what they have added are some very innovative designs. The Summer Collection sees the introduction of the Pandora ear cuff, worn at the top of the earlobe. The new chain-style rings give a new texture to your ring stack and look great grouped together. 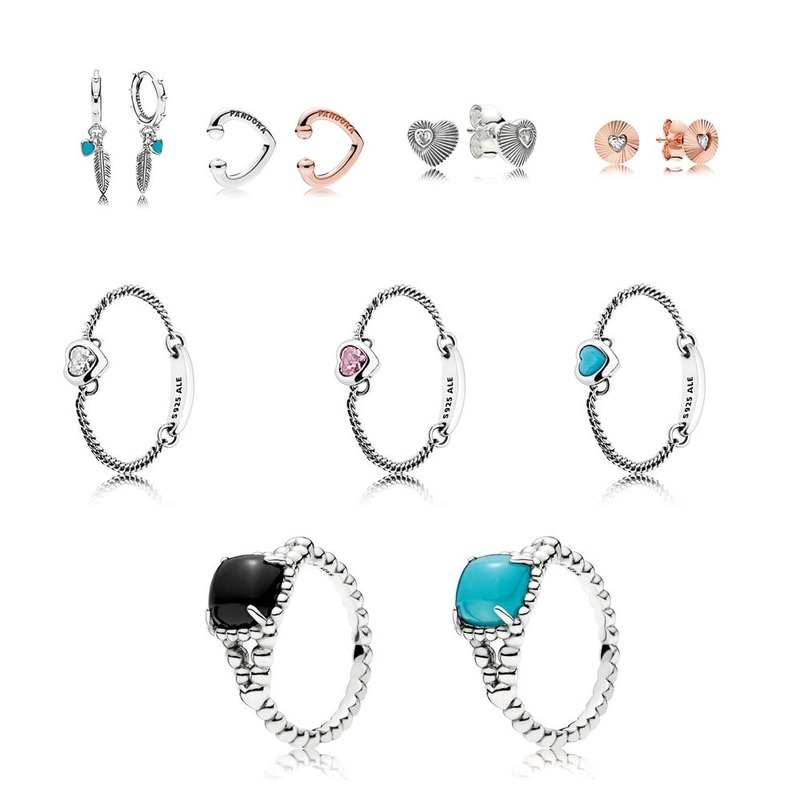 Other jewelry additions include a hoop earring with feather and turquoise heart dangle that are a great match to the feather pendant, earrings in silver and Pandora Rose to coordinate with the Fan of Love charm and pendant, and new statement rings with smooth black and turquoise cabochon stones. 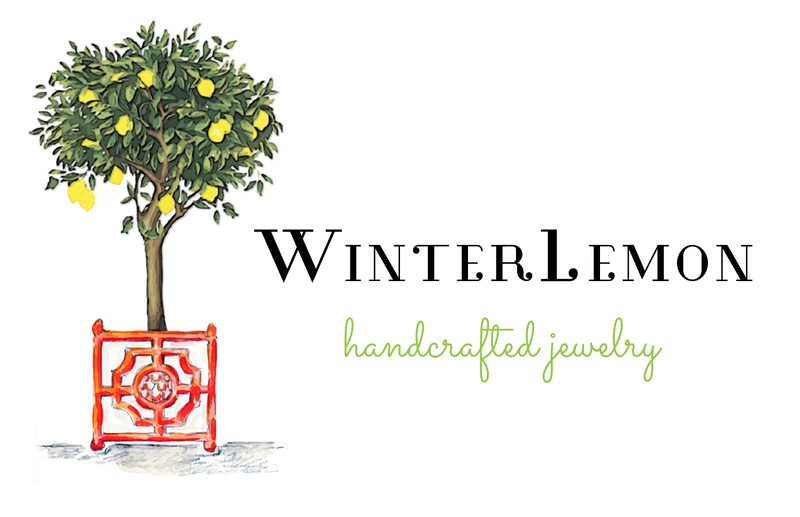 Much of WinterLemon jewelry features freshwater pearls. 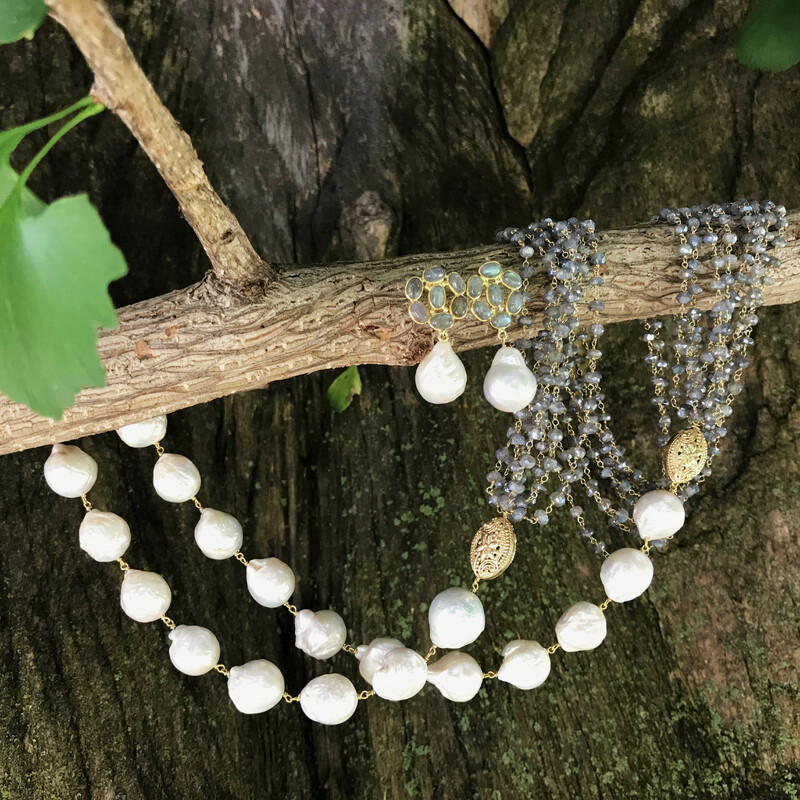 A twist on the classic pearl, freshwater pearls offer the modern girl the beauty of a pearl in a more contemporary, organic shape. 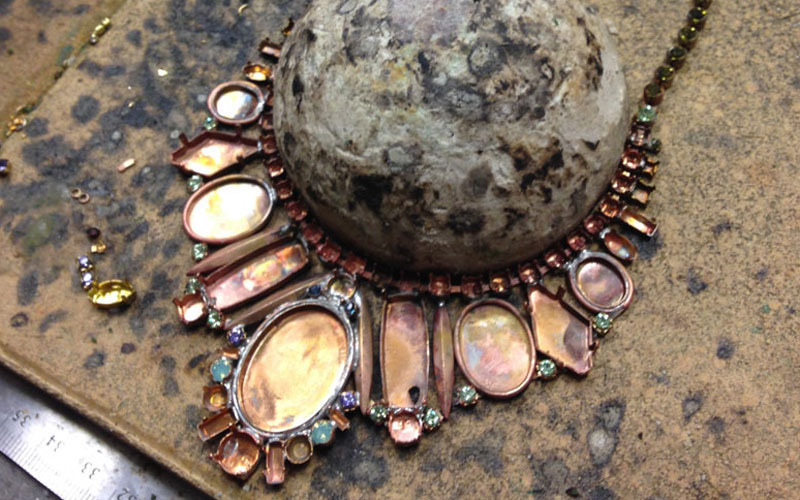 Combining pearls with natural gemstones, such as labradorite, brings out the natural iridescence in both elements. 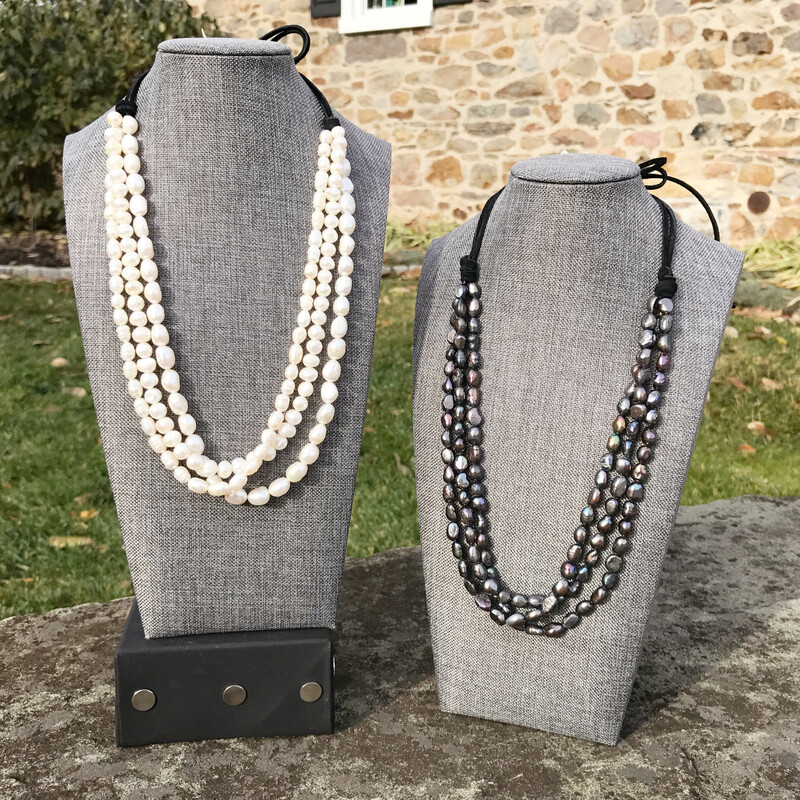 WinterLemon also makes an array of fashion-forward necklaces using freshwater pearls on suede and leather cord. 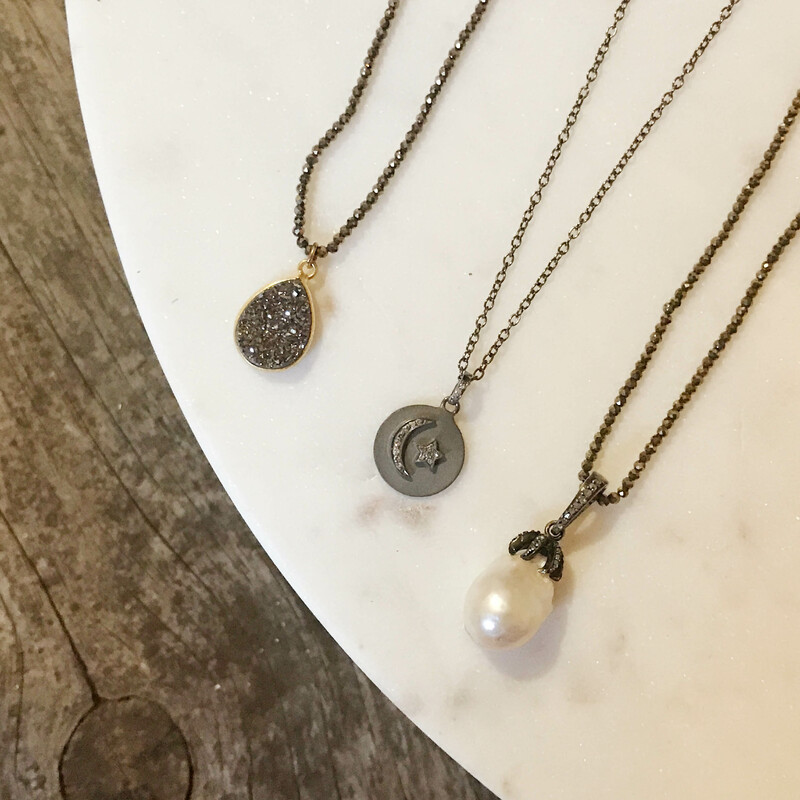 These necklaces range from collar-like statement pieces to delicate chokers and trendy lariats. 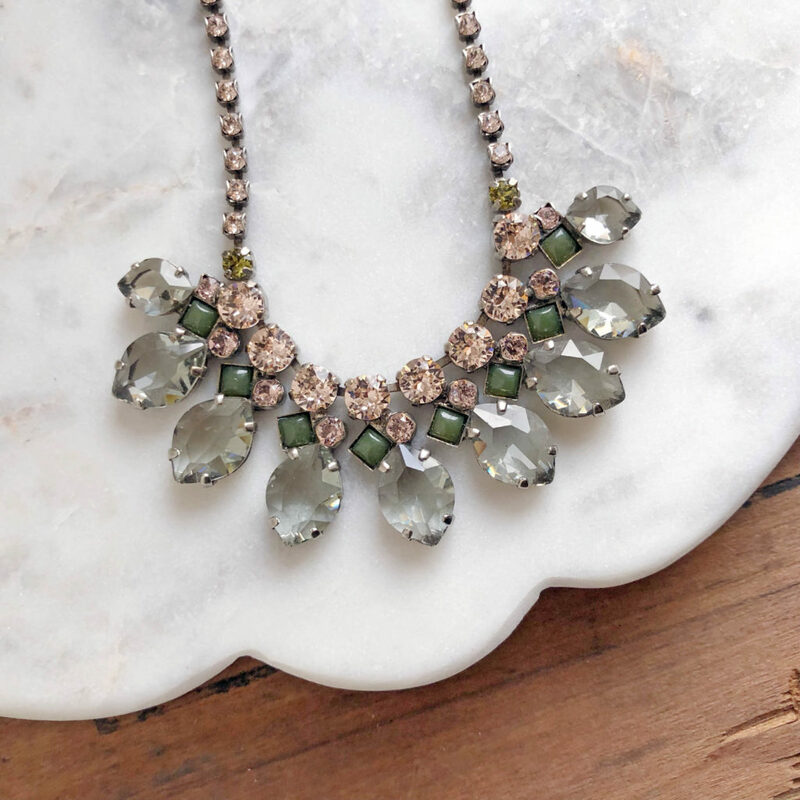 Neutral pieces are great because that can be worn on any occasion, but can often be boring and uninspired, WinterLemon elevates the neutral palette by mixing metals and using unique textures and faceted elements to reinvigorate your everyday golds, silvers, and greys. 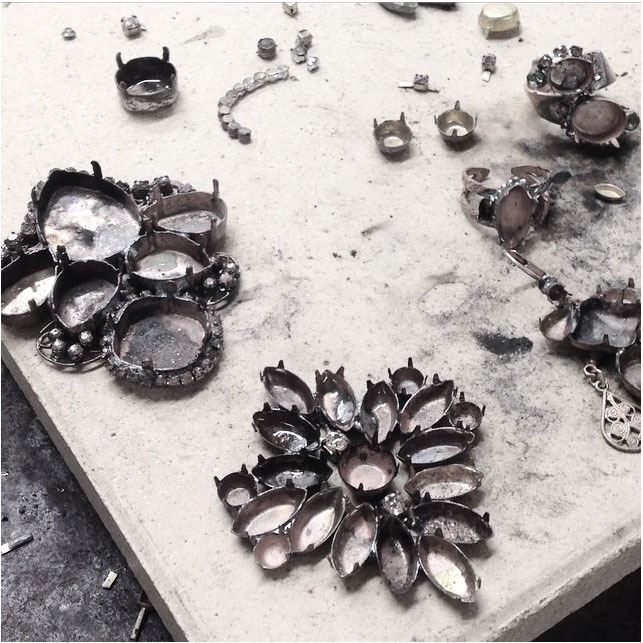 Many of their pieces incorporate oxidized silver, a darker and more edgy version of your traditional silver jewelry. Not only does oxidized silver pair beautifully with gold, making a fun mixed-metal combination, but it gives a unique sparkle to stones set within it. Another way WinterLemon adds some fun to your everyday neutrals is through subtle shine. 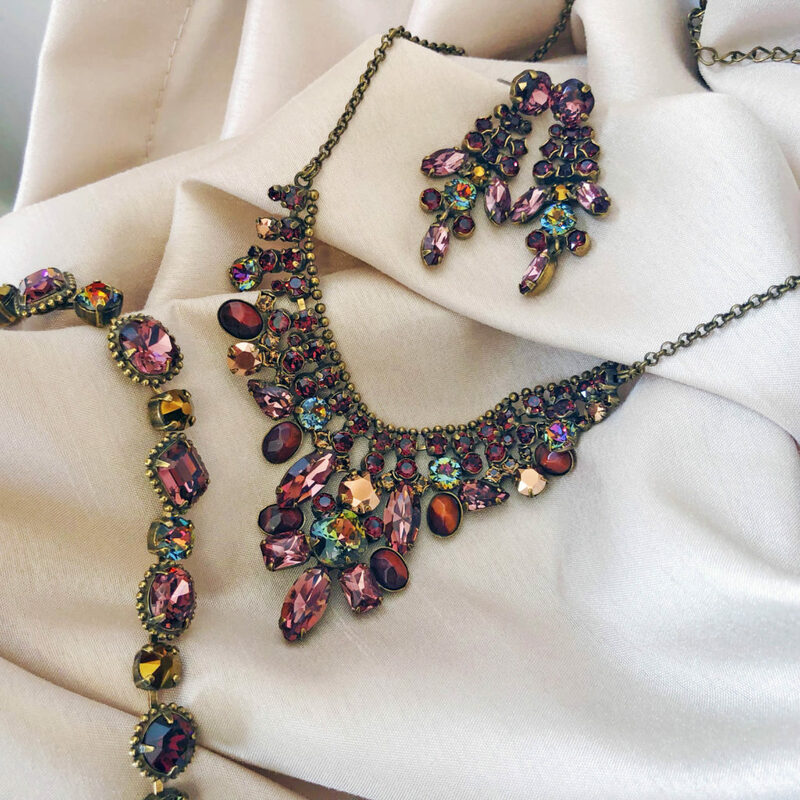 Using druzy stones, beaded chains, and champagne diamonds, they create an ethereal sparkle through darker elements. 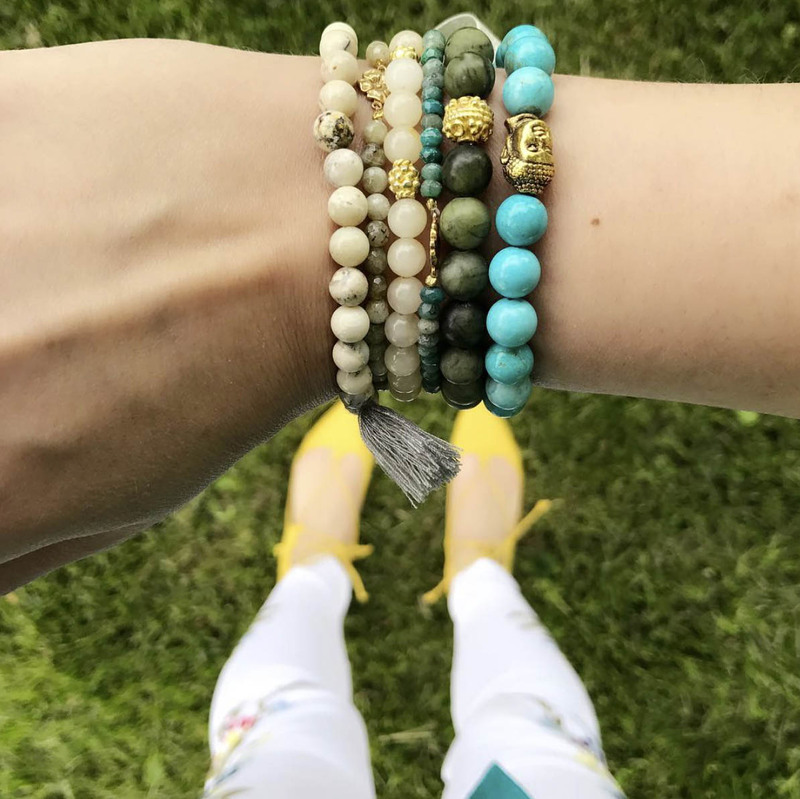 For those days when you want to add a fun pop of color to your wardrobe, WinterLemon’s colorful gemstone pieces are a great choice. 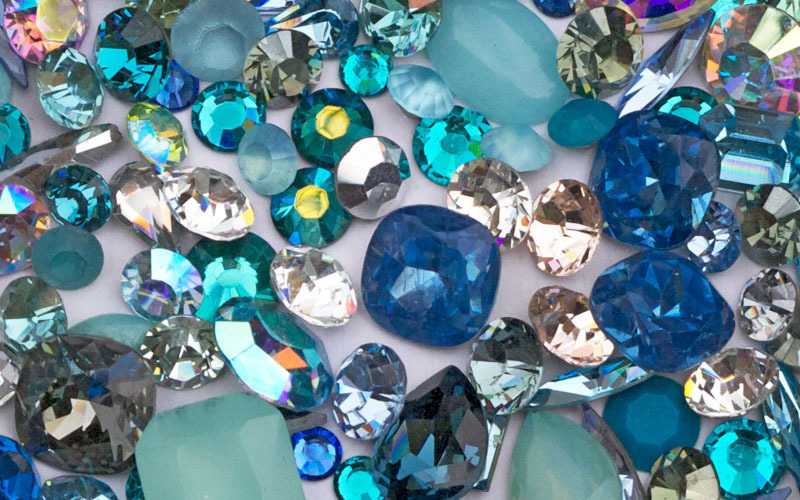 Using the pure tones of real gemstones allows them to create pieces with a depth and hue not found in manufactured or dyed stones. 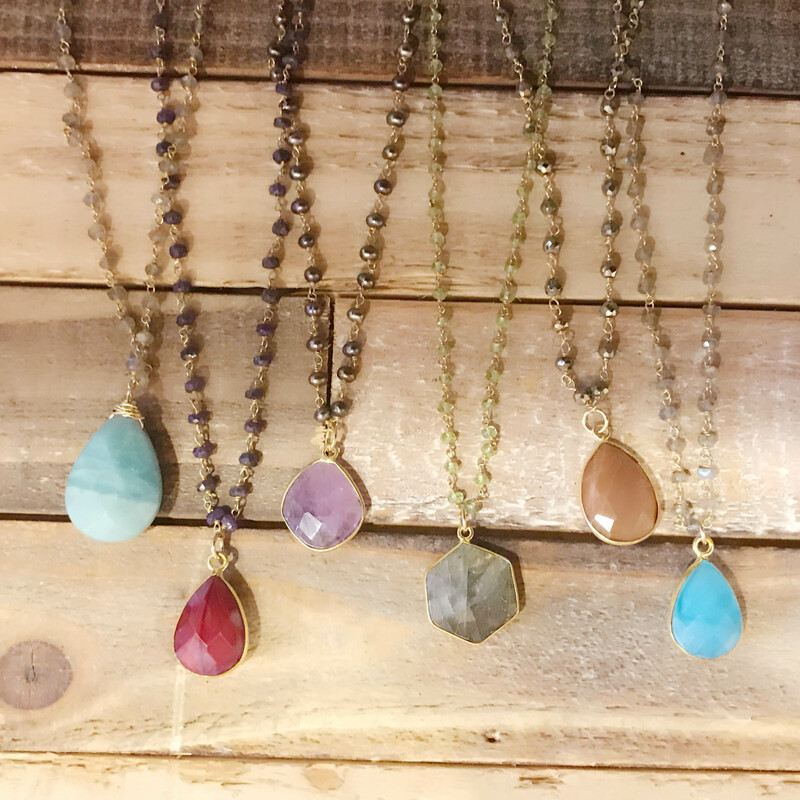 We love these pieces featuring a faceted gemstone on a colorful beaded chain in a complementary color. Looking for a statement piece in a signature color? 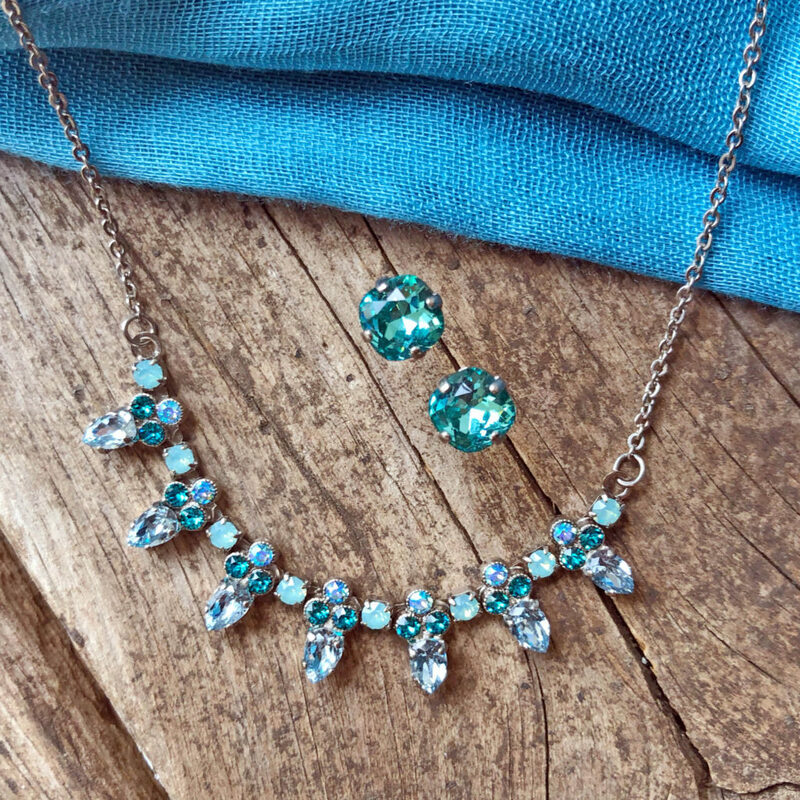 One-of-a-kind crafted pieces, like the one shown below, use color in sophisticated ways to create a piece of wearable art everyone will be talking about. 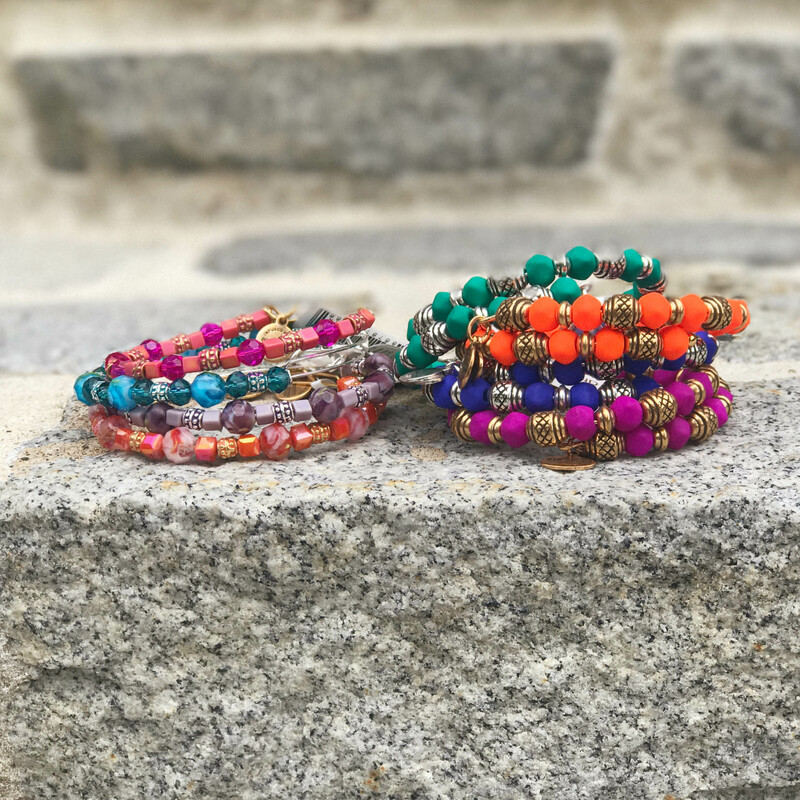 Another great wrist addition are the beaded wrap bracelets shown below. Not only are they gorgeous, they are versatile as well! You can wear them on your wrist on day and style them as a necklace the next. 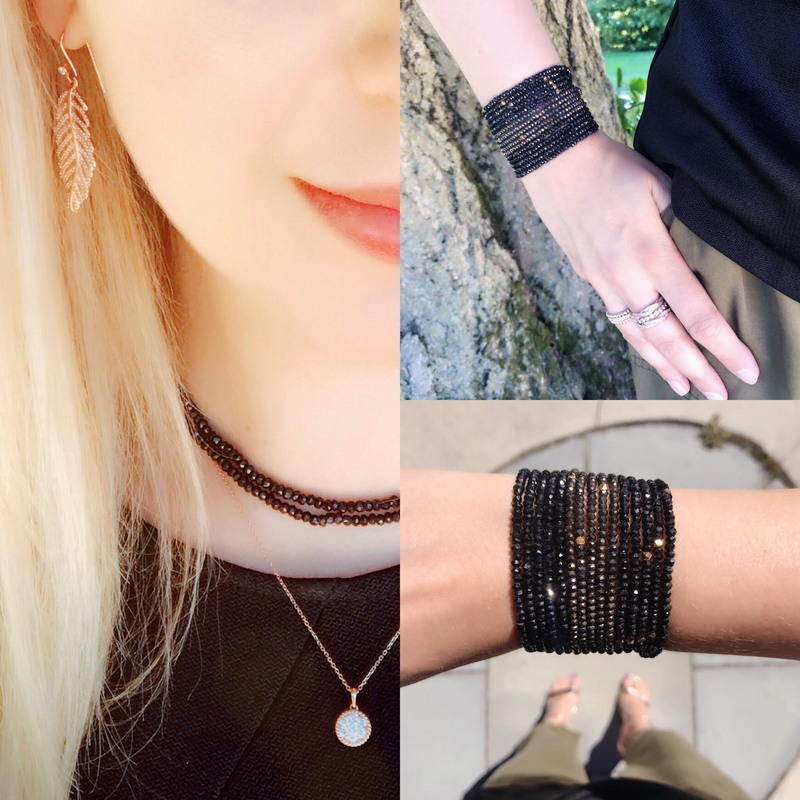 A five-wrap bracelet can easily turn into a long layering necklace or a delicate double wrap choker. 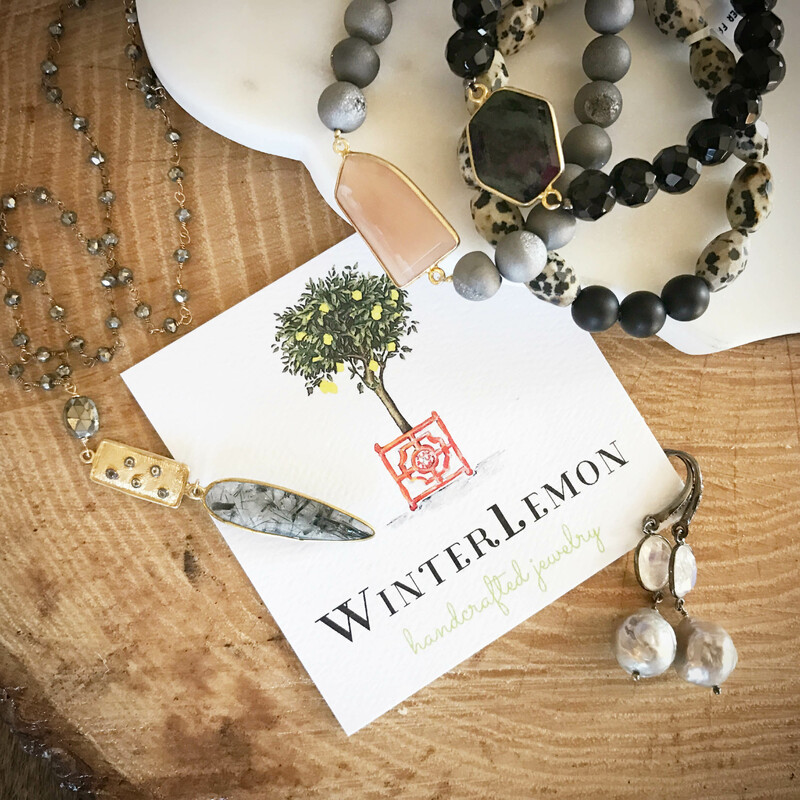 We love our WinterLemon jewelry (can you tell?). What we love as much as the beautiful and unique styles they offer is that they are handmade in Bethlehem. As a small, local business, we appreciate all of our customers who make the choice to support their local community and love the opportunity to pay it forward and support local artists as well. Do you love what you see as well? 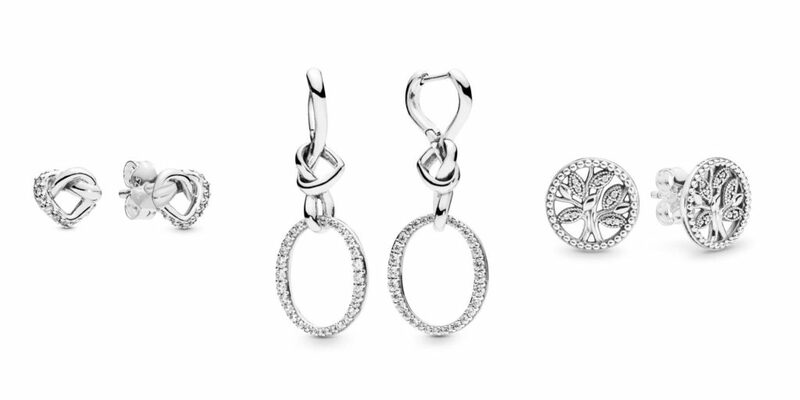 Stop by Versant to see these beautiful pieces in person! Exciting news! 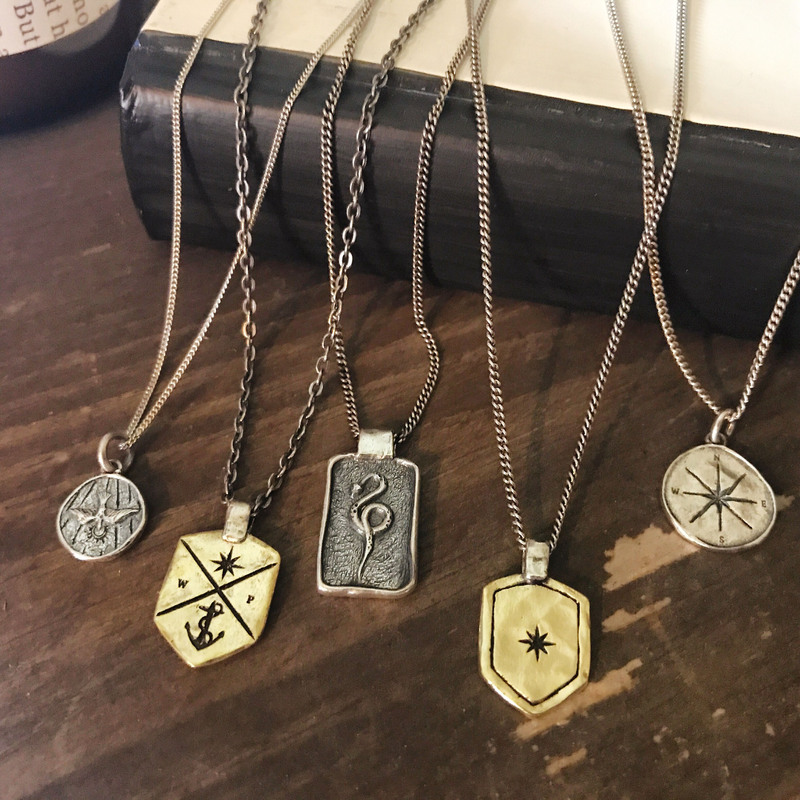 We have just received the new Waxing Poetic Men’s line of jewelry, Poet. 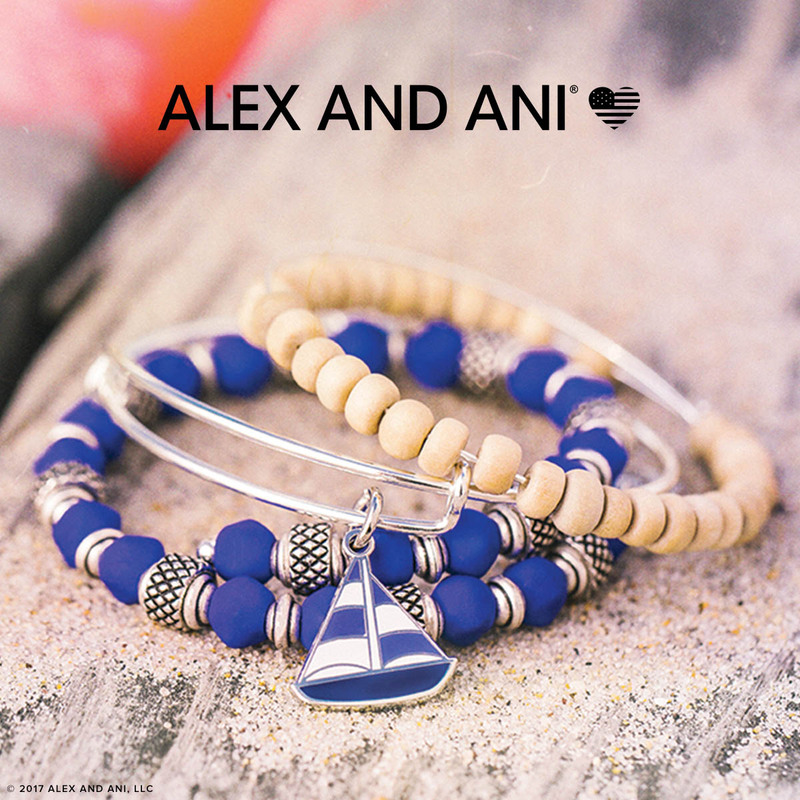 Just in time for Father’s Day, these unique pieces feature necklaces, bracelets, and rings. Poet is crafted from sterling silver, brass, and quality leathers for a long-lasting keepsake. 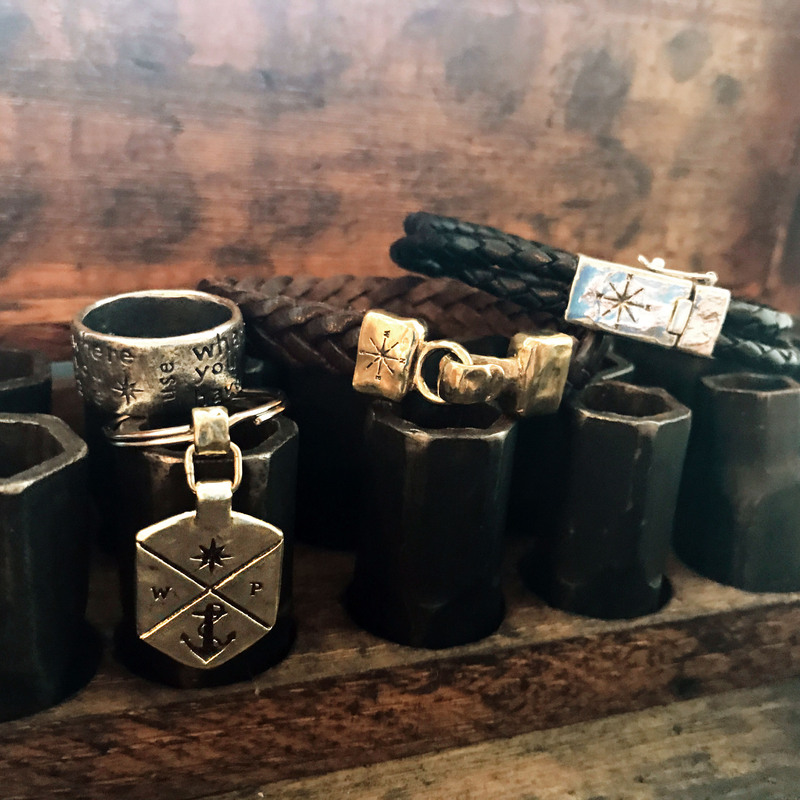 Each piece is inspired by wax seals and signet rings and designed with a rugged edge and meaningful symbols. 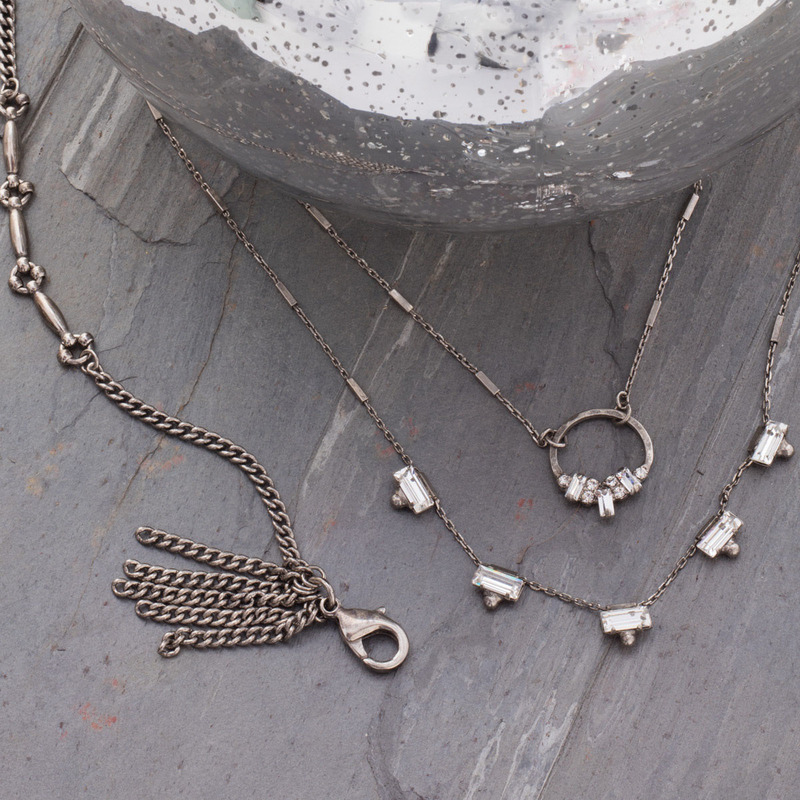 The necklaces included in the Poet line are beautiful talismans displayed on a sturdy silver chain. The Poet line uses a lot of oxidized silver to bring a more roughhewn character. 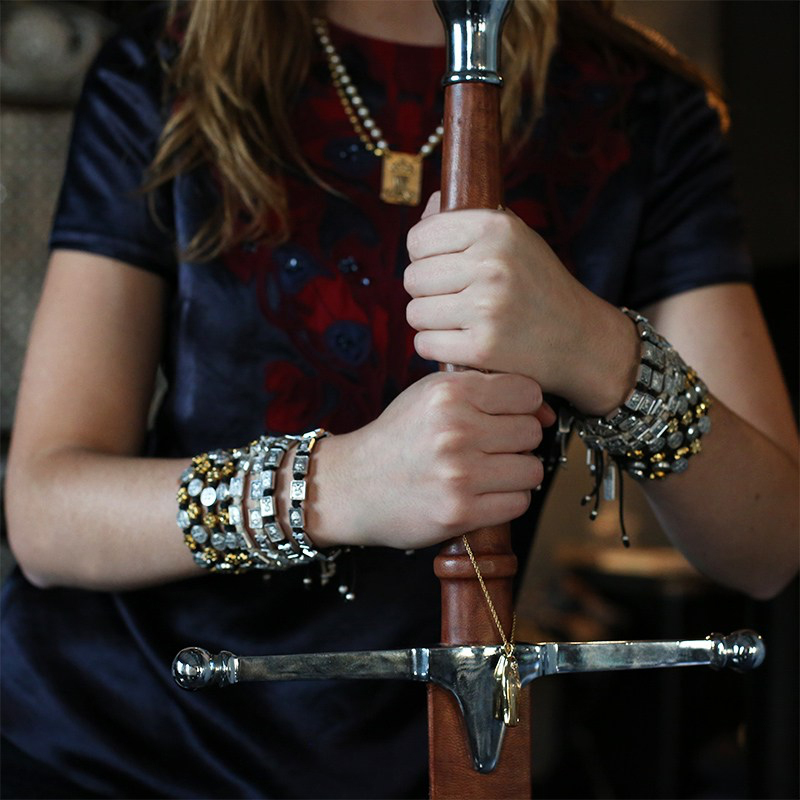 Accented with hammered textures and classic heraldic shapes, we love their unique style. 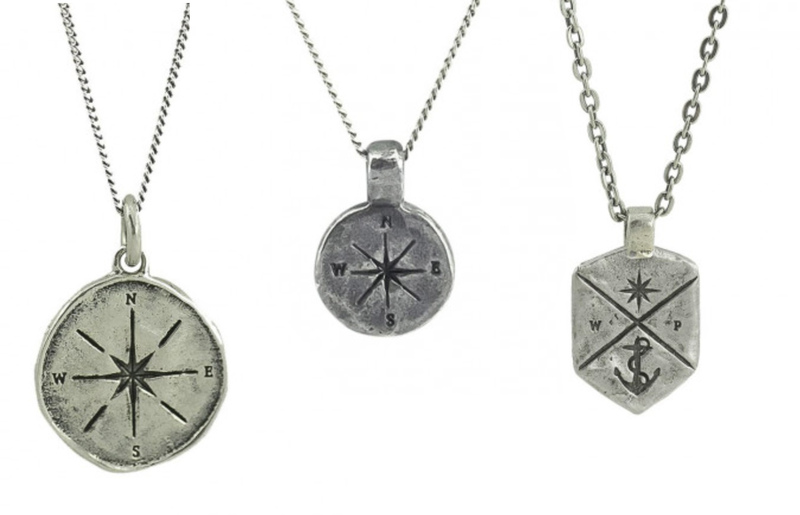 For the man who likes to travel and explore, the Compass and Explorer necklaces make a meaningful gift. 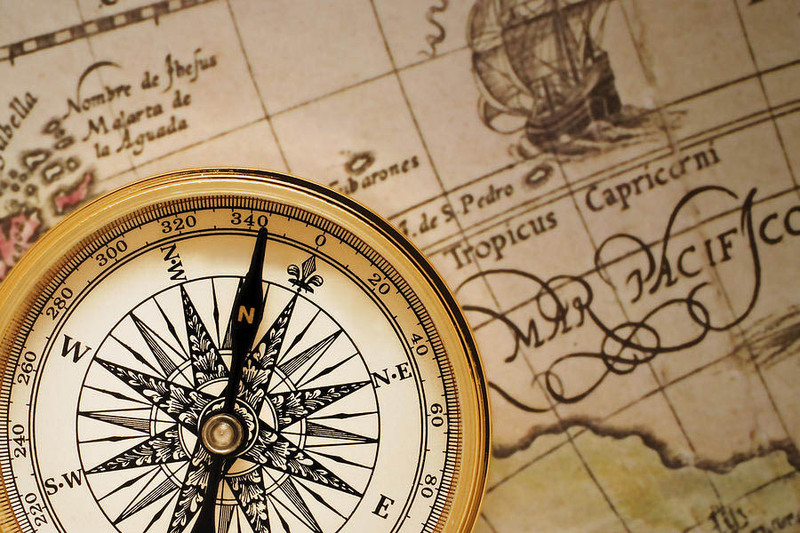 Emblazoned with the symbol of the compass, they are reminders to be brave and explore beyond the edges of ones comfort zone. 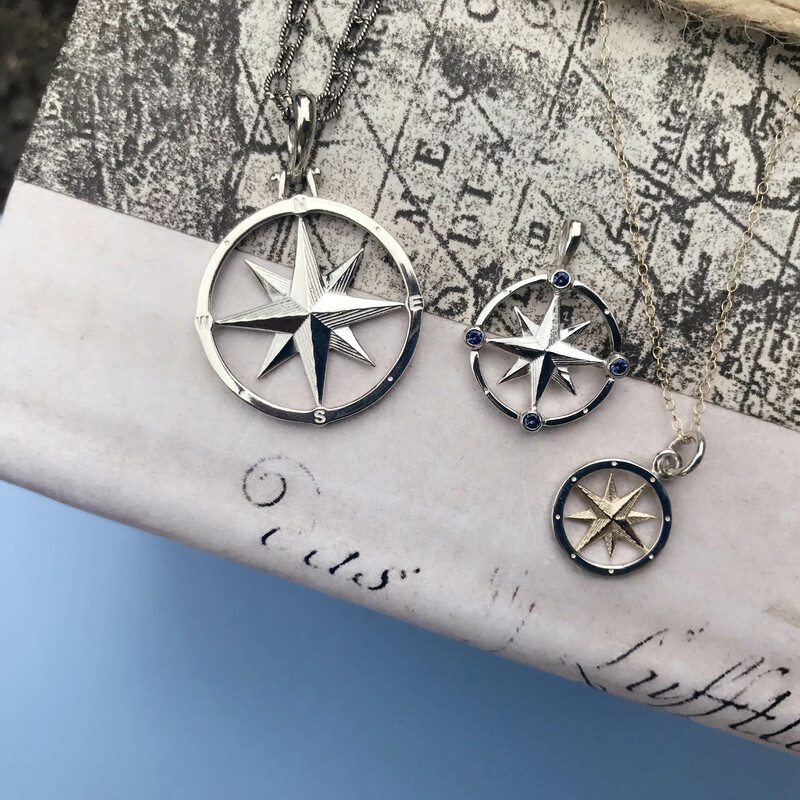 The Coat of Arms necklace, featuring the North Star and an anchor, reminds the adventure-seeker to both follow the stars and stay grounded. 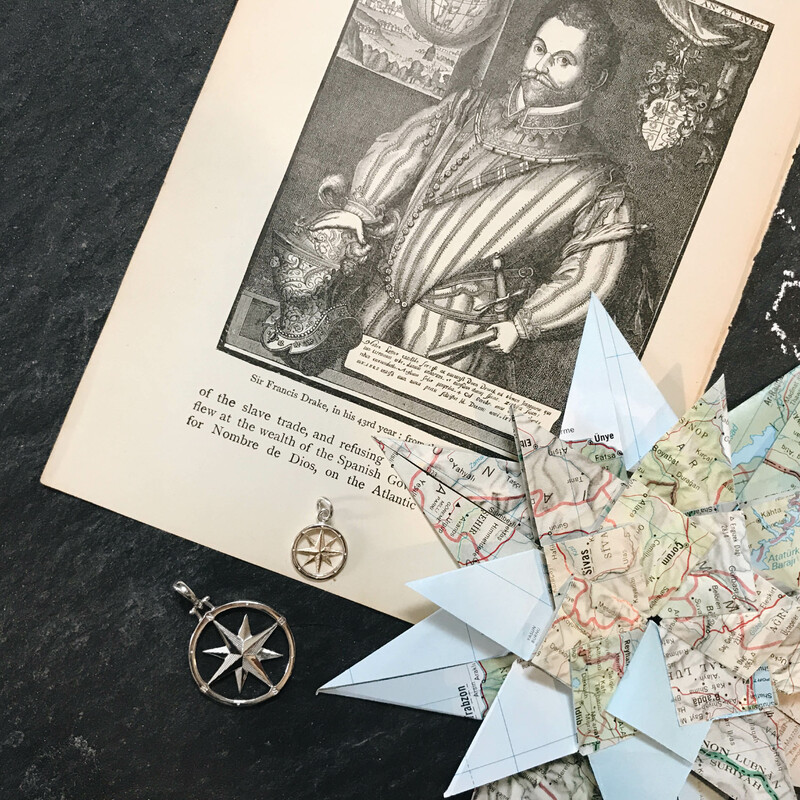 To honor the man who is an ever-steady presence in the family, the star-themed Midsummer Night, Star Shield, and Polaris necklaces are a wonderful choice. 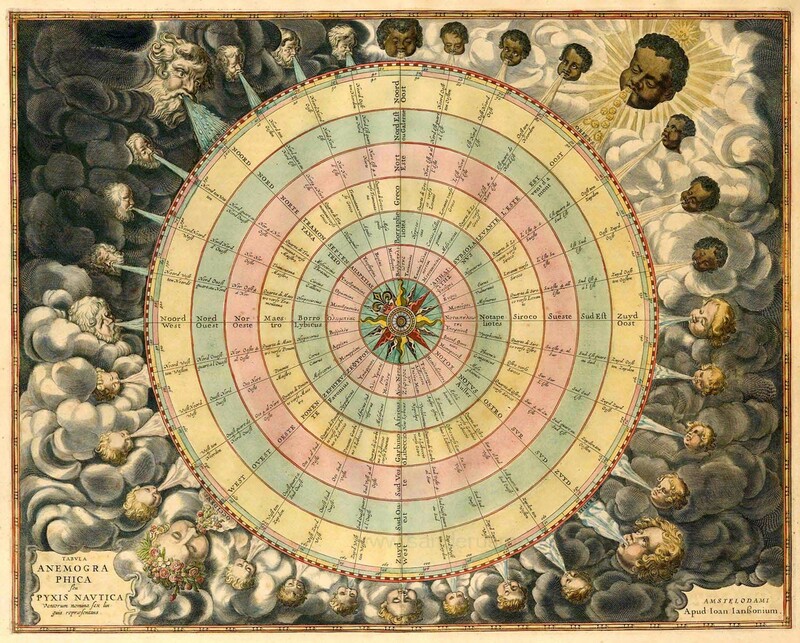 Used for centuries in celestial navigation, the stars are a symbol of eternal constancy. 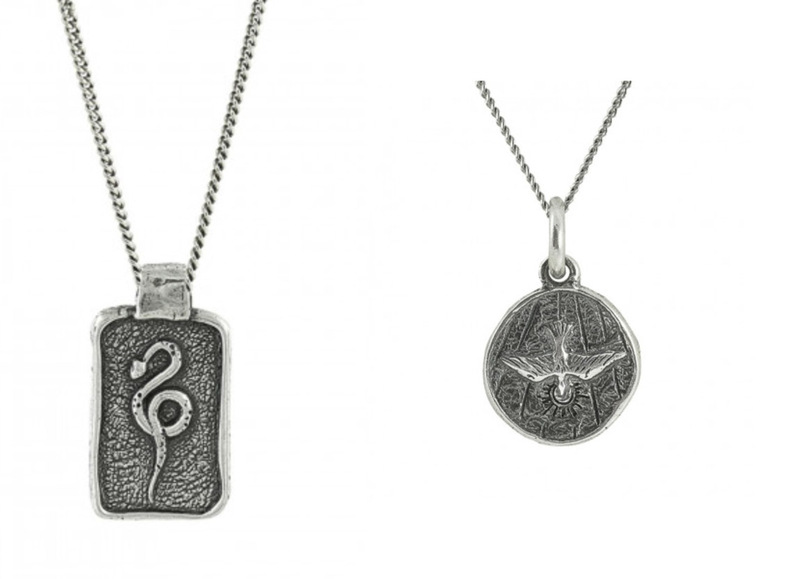 We also love the Anguis and Peacebringer necklaces. 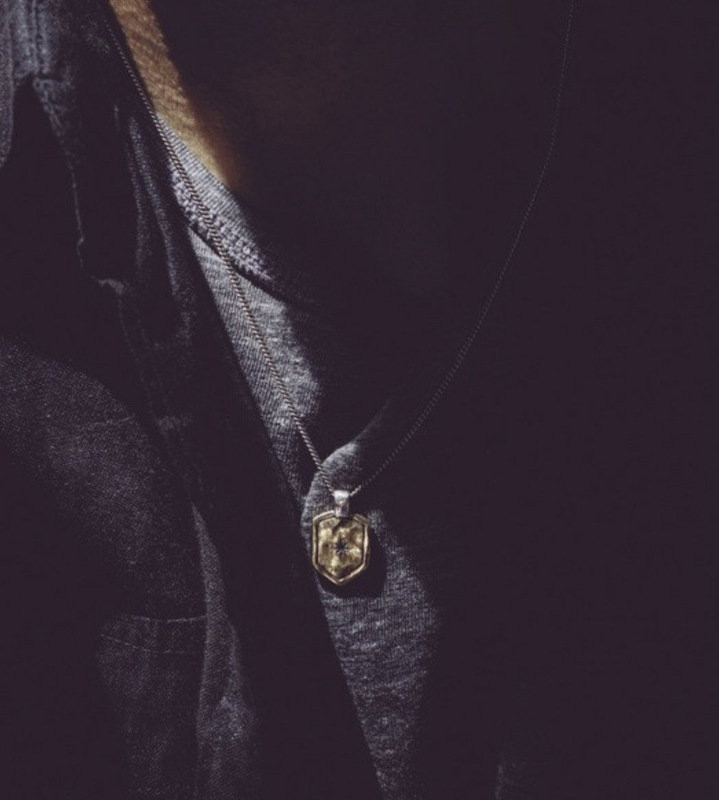 Symbolic of knowledge, discovery, healing, and transformation, the snake centered on the Anguis necklace celebrates the man who melds a strong mind and dedicated spirit. 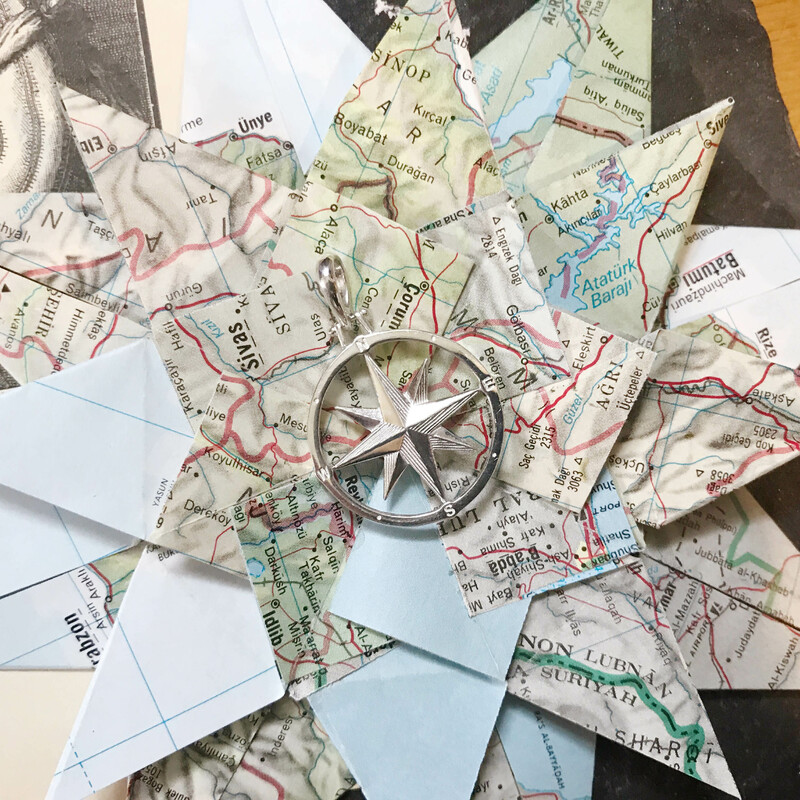 We think this piece makes a meaningful gift for a man in the medical profession. 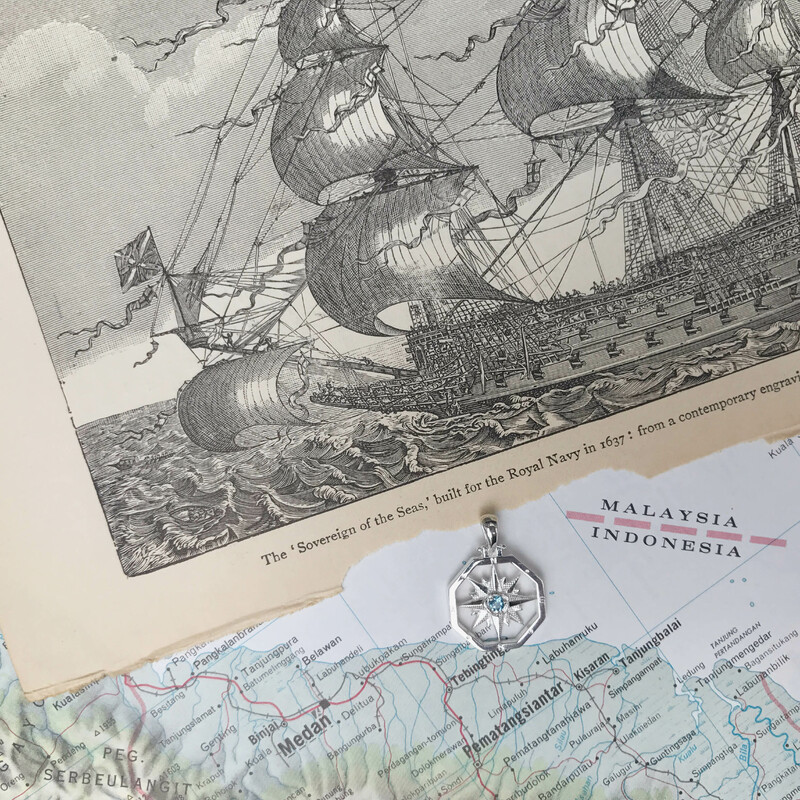 The Peacebringer necklace displays a dove, emblem of peace, accord, and new beginnings. 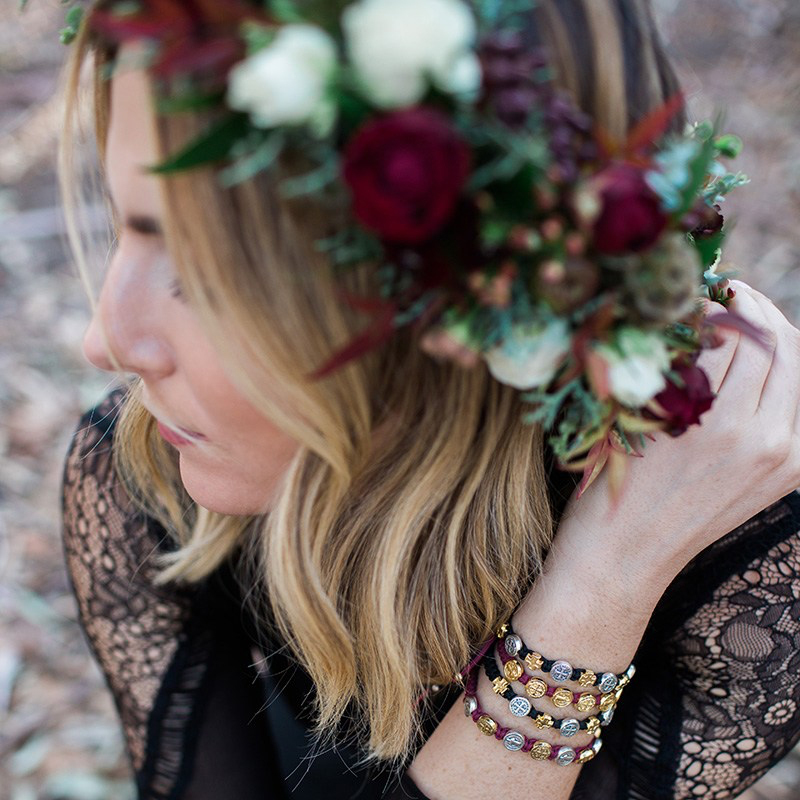 Beyond the necklace offerings, Poet has a selection of gorgeous leather bracelets and distinctive rings and keychains. 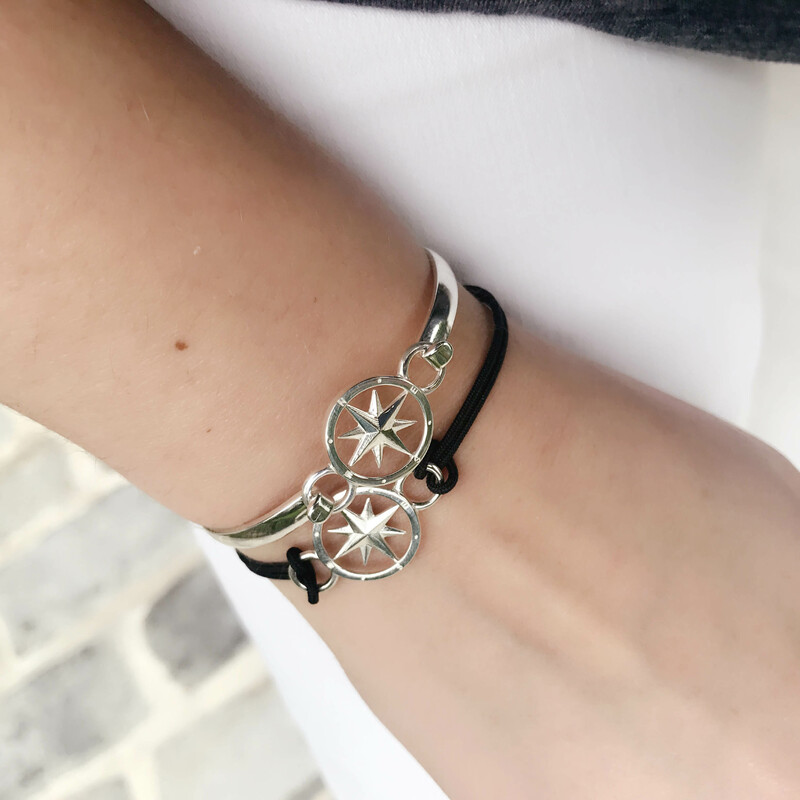 Both leather bracelets are etched with the compass symbol on the clasp. The brown braided leather Unified Front bracelet is paired with a brass clasp and the black two-strand leather bracelet has a sterling clasp. 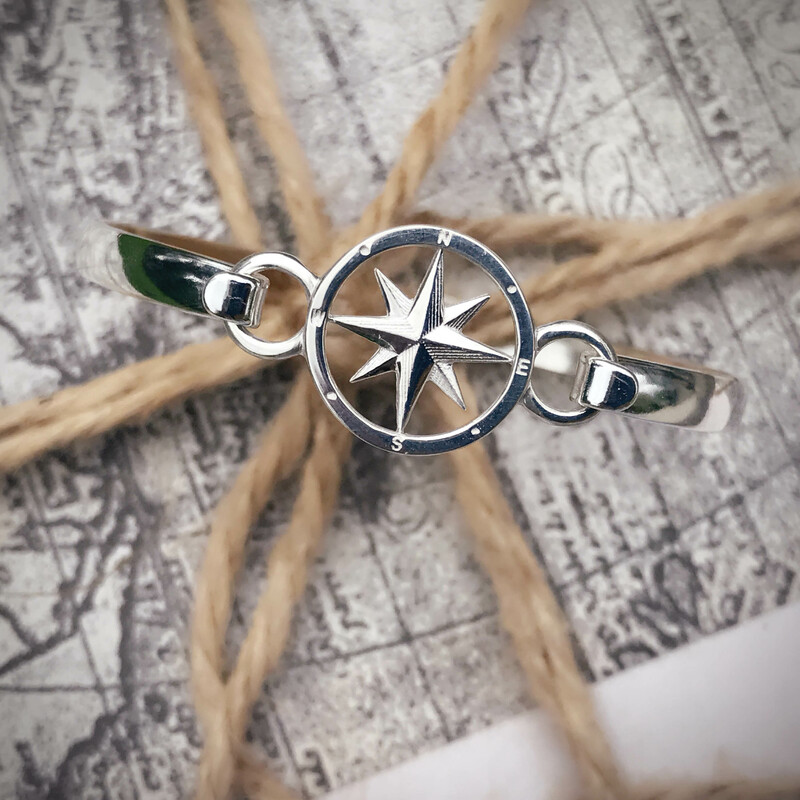 The rustic sterling Genesis ring is fashioned after Poesy rings. Poesy rings were popular during the 15th through the 17th centuries in both England and France as lovers’ gifts, and feature a short inscription. 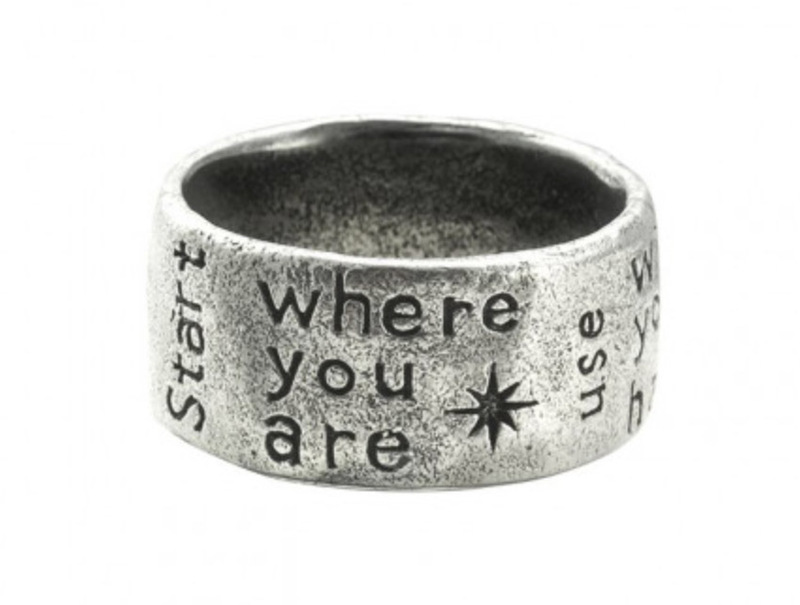 The Genesis ring reminds us to start where you are, use what you have, and do what you can. Finally, the coat of arms key fob is a great introduction to the Poet line for the man who is still on the fence about wearing jewelry. 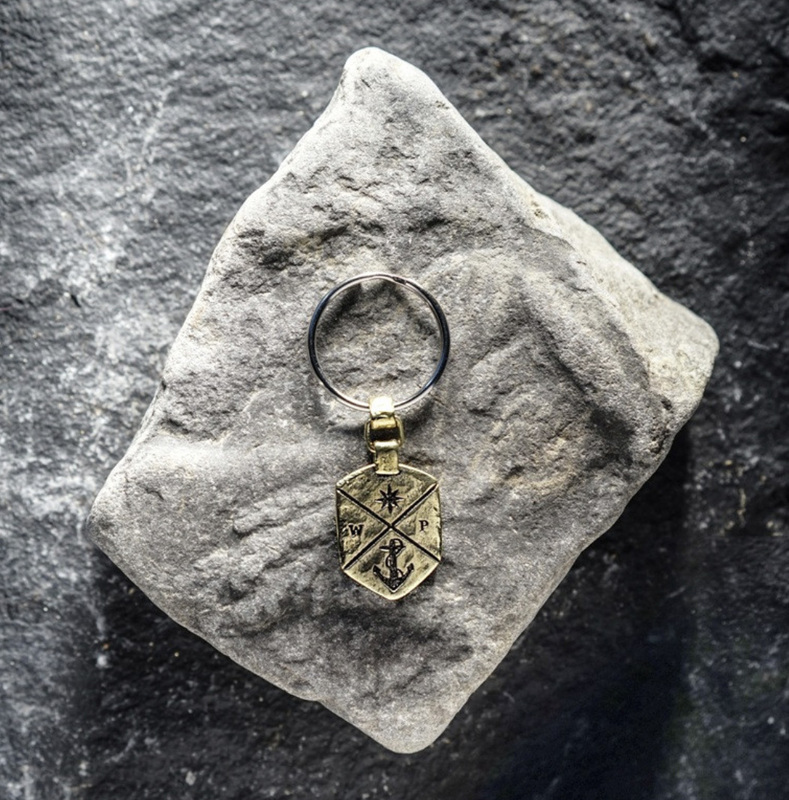 We love the coat of arms symbol- it makes a great key fob for the ladies too! 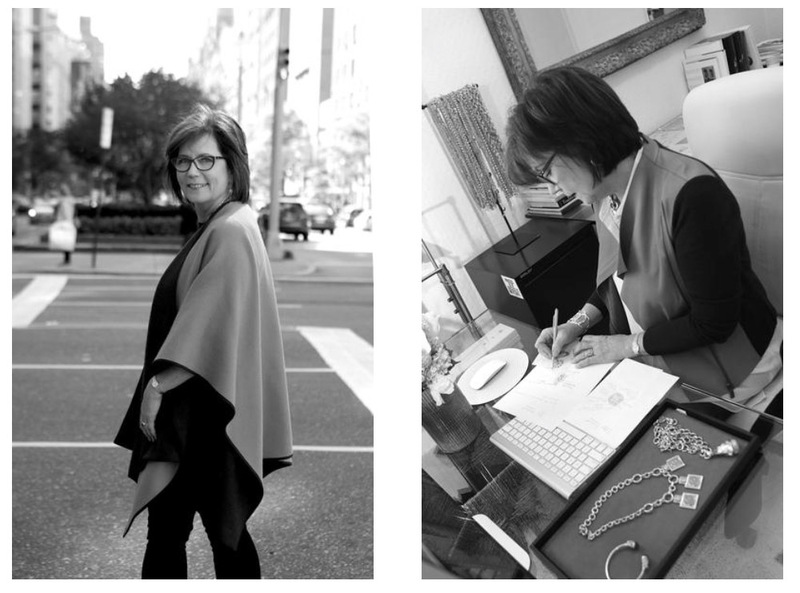 New York-based designer Julie Vos is the woman behind her namesake brand. 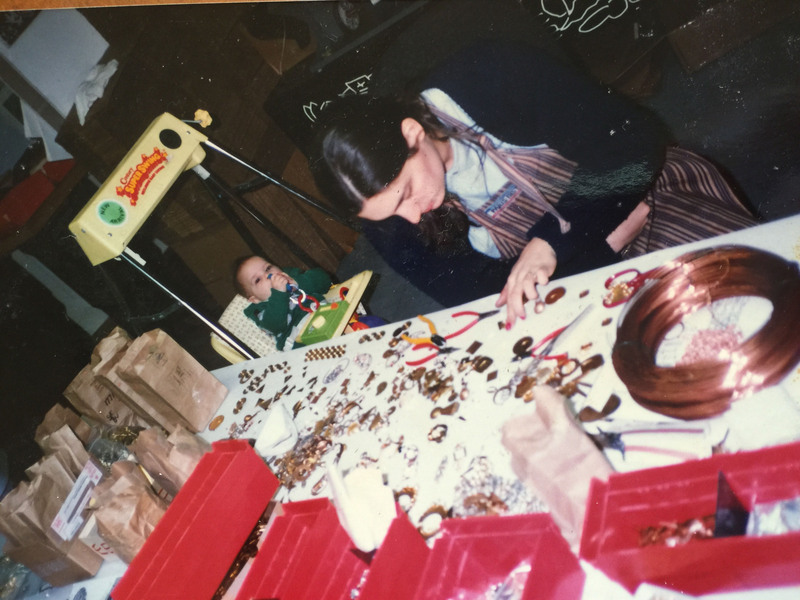 Julie Vos started as a desire to give women the kind of jewelry they were looking for. The brand is modeled on the belief that we make the beautiful world we live in, with inspiration and discipline. 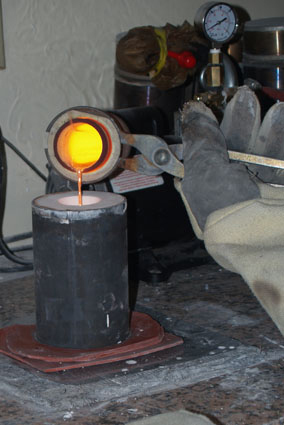 This philosophy translates into the design of every piece of jewelry. Julie Vos’ pieces are made from nickel-free brass finished with 24K gold, giving them a beautiful warm hue at an affordable price. 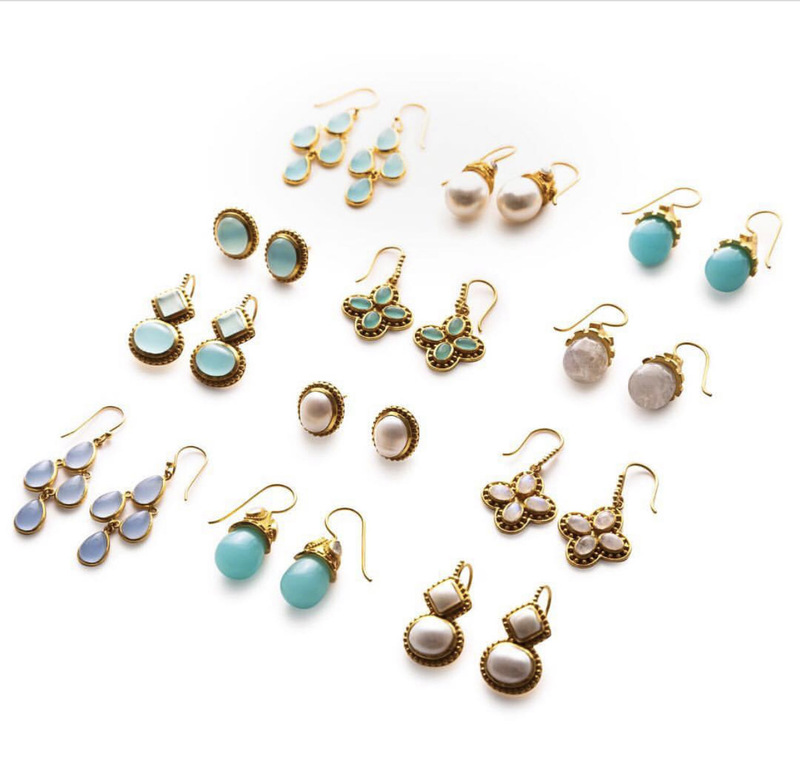 They are accented with semi-precious stones, imported glass, and pearls in a wide range of fresh and fun hues. Each piece is sealed to prevent tarnish, allowing your gems to shine on without worry. 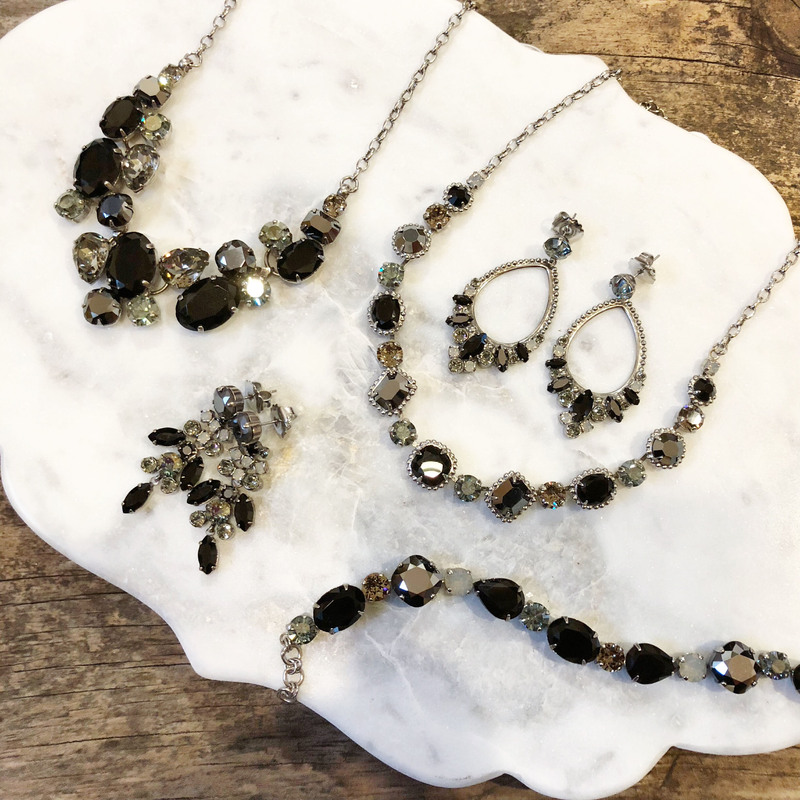 From dainty accent to statement piece, Julie Vos makes a wide array of styles in necklaces, rings, earrings, and bracelets. 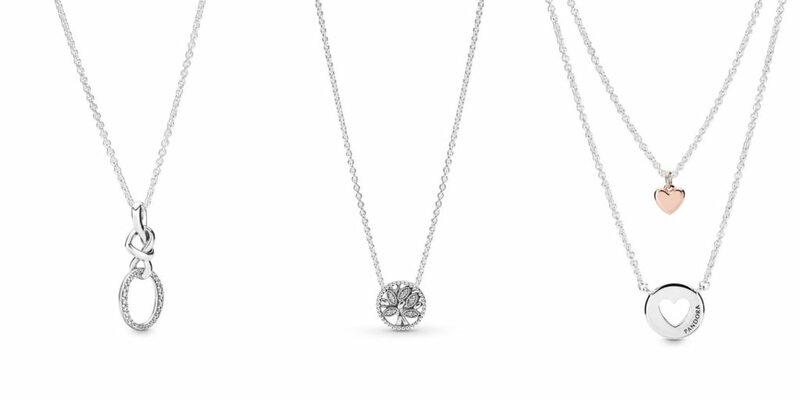 One of her signature styles is the long statement pendant. 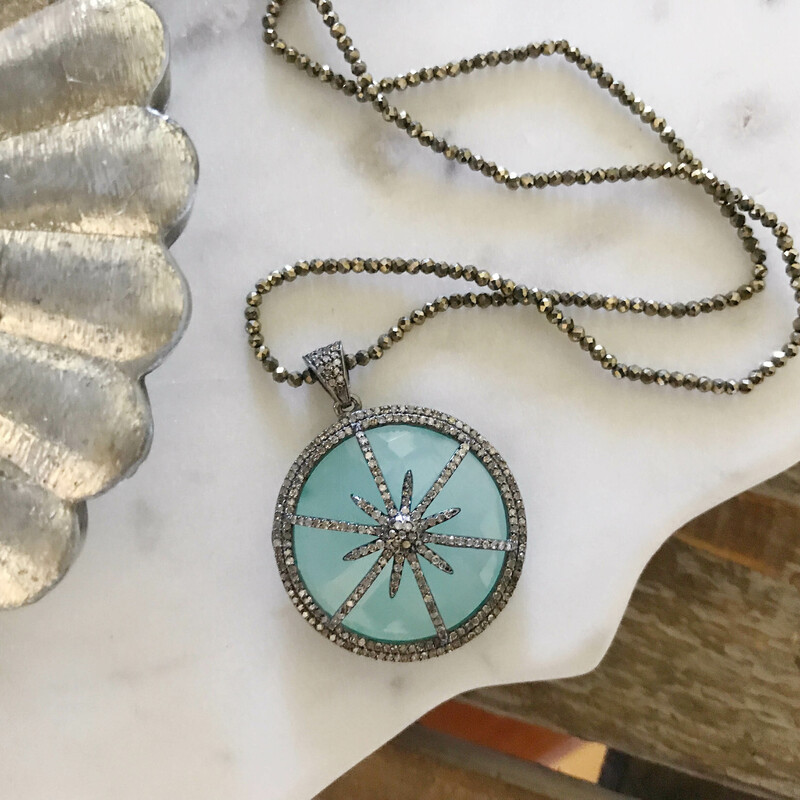 One of our favorites, the coin pendant shown above, is frequently spotted on fashion bloggers Instagram feeds. 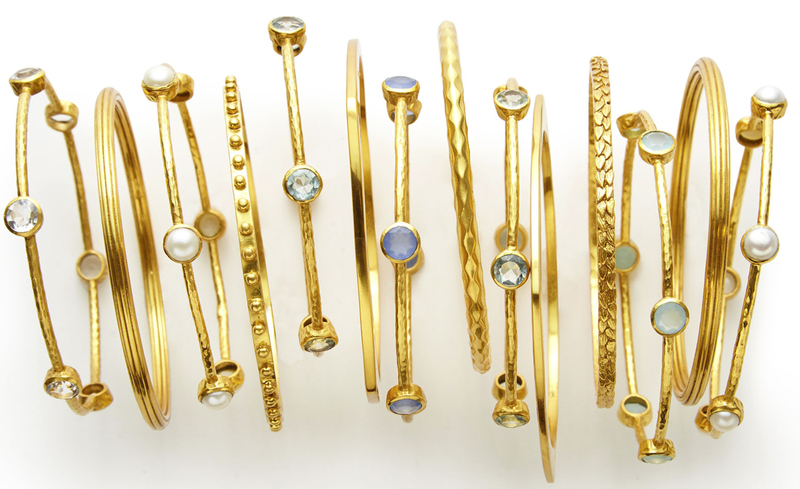 For the girl who likes to build her bracelet stack, Julie Vos makes some beautiful stackable bangles. 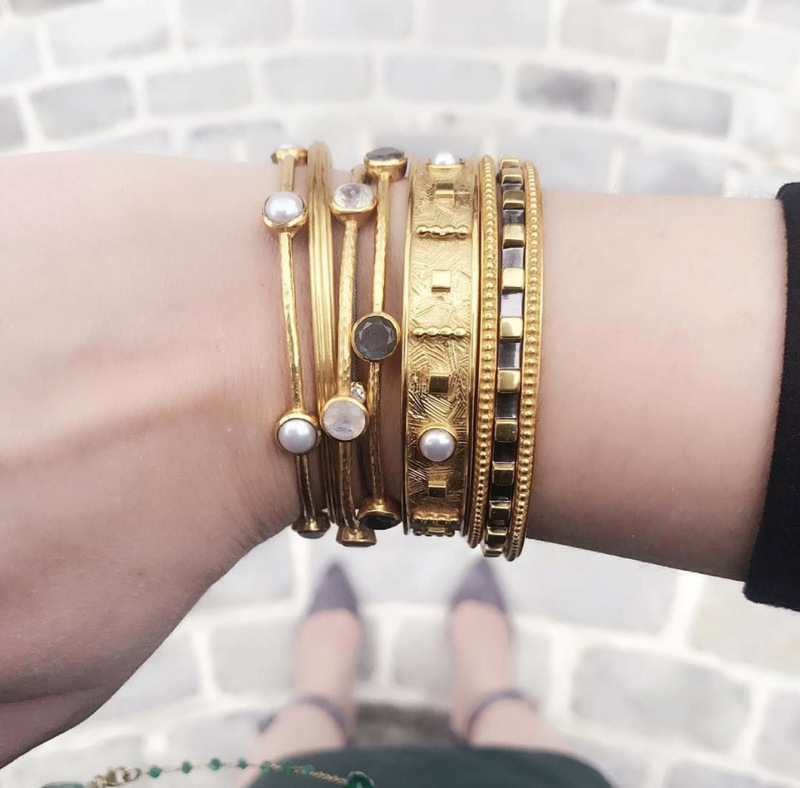 The 6-stone Milano bangle is available in a wide variety of stones and looks gorgeous with several bangles of different hues stacked together. 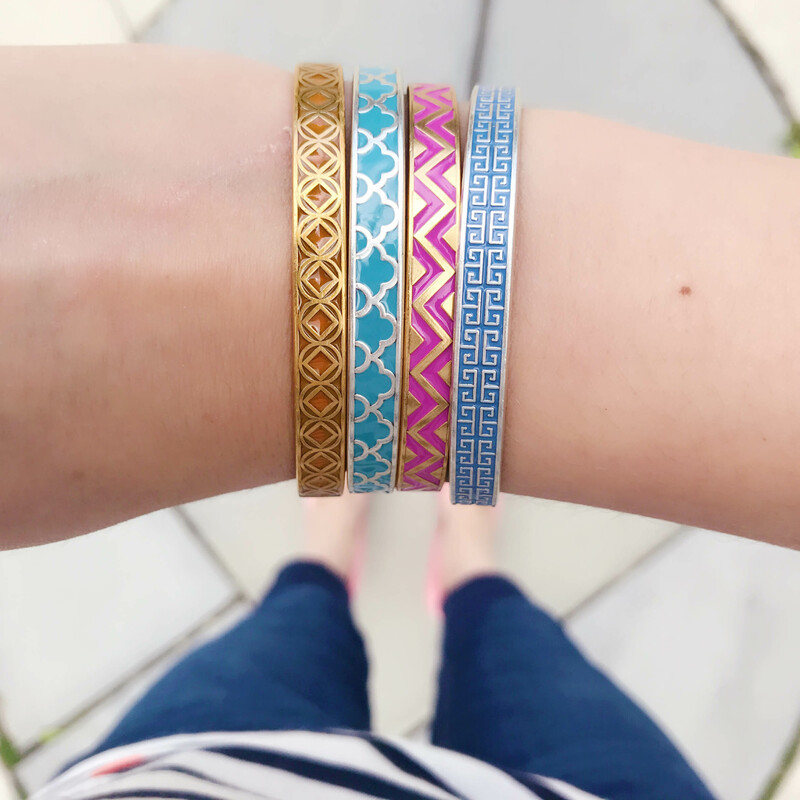 The bangles without stones feature unique textures that add a touch of interest to a stack lacking in diversity. 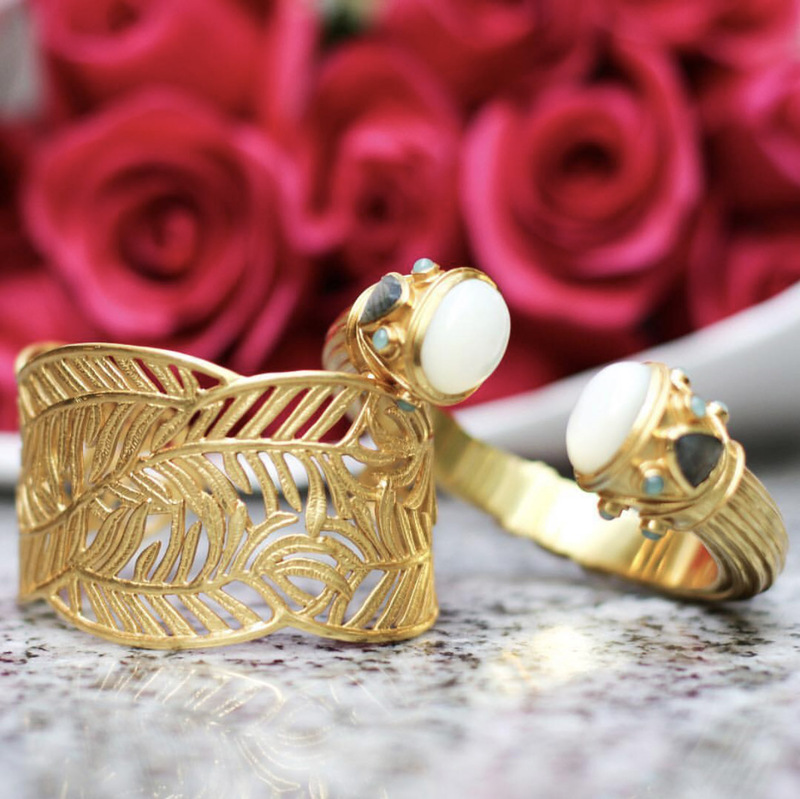 If you are looking for a big piece as a fashion highlight instead of a curated stack of bracelets, Julie’s show-stopping cuffs are the perfect addition to your jewelry box. 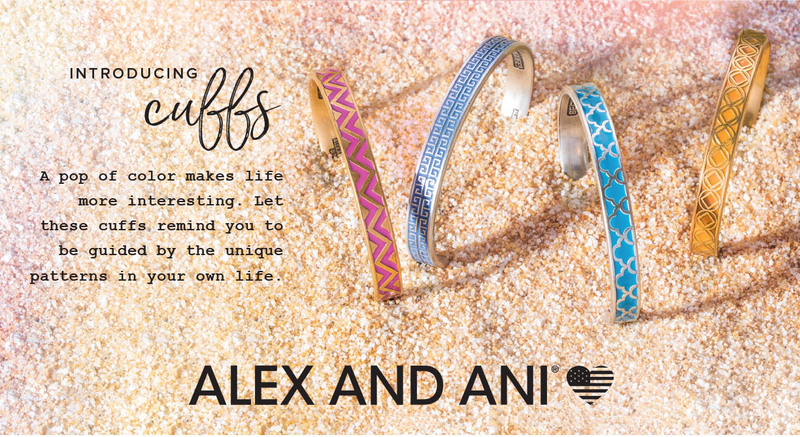 Her openwork cuffs have the drama of a statement piece without the heaviness. Another favorite of ours is the hinged cuff collection, which features museum-inspired stonework at the caps of the cuff. Ears feeling left out? 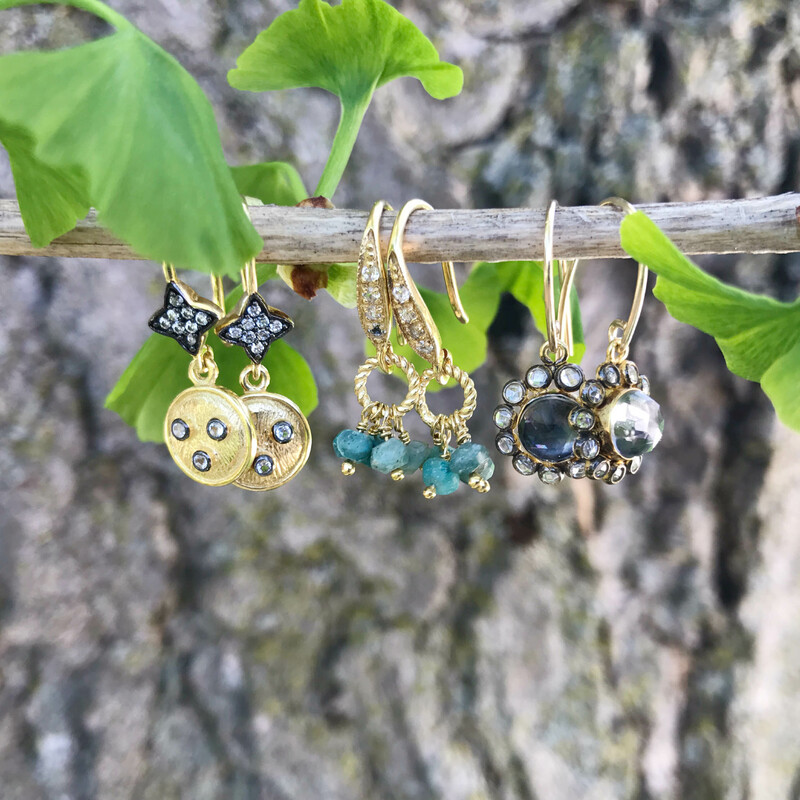 Check out Julie’s chandeliers, hoops, and studs! We love the statement studs featuring pearls and semi-precious stones- very Chanel!- and hammered texture hoops. 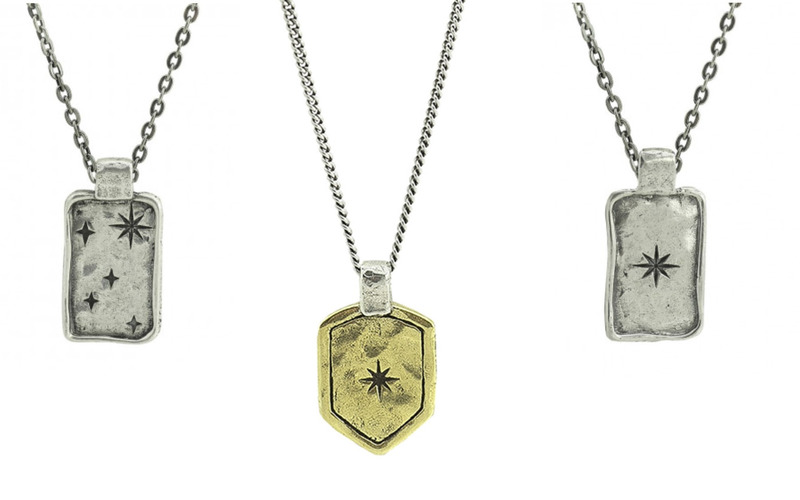 My Saint My Hero jewelry was created around the idea of wearable blessings- reminders of the light within us and our power to do good in the world. Throughout their journey together, My Saint My Hero founders Amy D’Ambra and Christine Rich have been drawn to the small pilgrimage town of Medjugorje in Bosnia and Herzegovina. On a visit there in 2010, Amy watched as local women hand wove bracelets with love, praying with every knot. Wanting to share a bit of the sacred place, she brought a few bracelets home to Los Angeles. 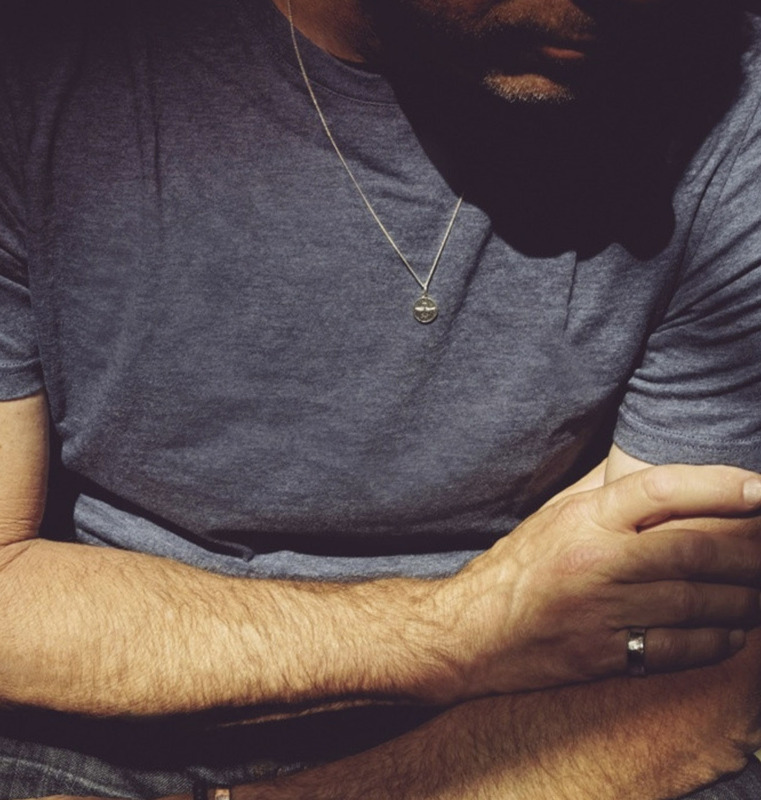 Those pieces now form the heart of the growing My Saint My Hero jewelry line. These bracelets that form the core of the My Saint My Hero line of jewelry is a macrame bracelet featuring the Benedictine Medal. This medal is a symbol of blessing and of protection. The Benedictine Cross is one of the Church’s most powerful symbols of divine protection. 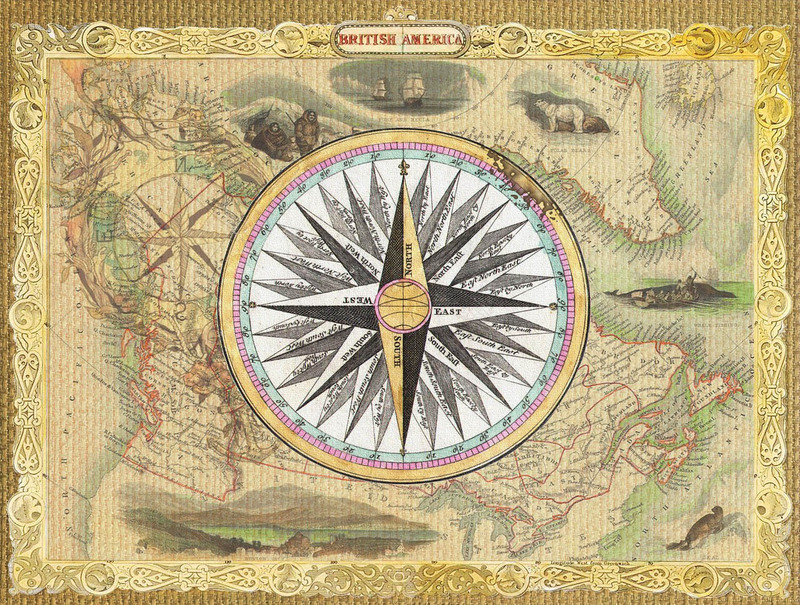 It was created in the mid 600’s as a symbol of the spiritual truths that enabled St. Benedict and his many followers to resist evil and do good. My Saint My Hero believes that living our life with light and remembering that we are blessed will spread goodness throughout the world. They have themselves embodied this mission with their partnership with the women of Medjugorje. They have empowered the women of Medjugorje through meaningful work – providing them with a support system and income to better themselves with the dignity of their beautiful trade. The work they provide allows them to rise above poverty level to put food on the table, shoes on their children’s feet and even have the opportunity to send their children to University. As each bracelet is made with prayers and good intentions, My Saint My Hero hopes that each wearer of these bracelets is reminded that they are blessed with the same abilities. 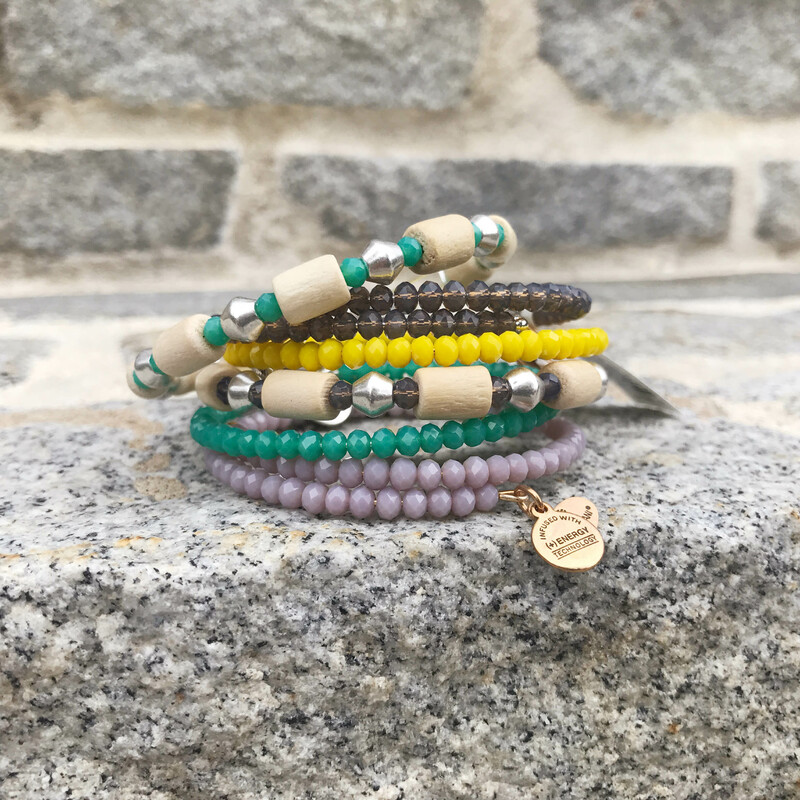 By wearing the bracelet by your hands, it is a reminder to continue to use your hands and your strength to do good in the world. 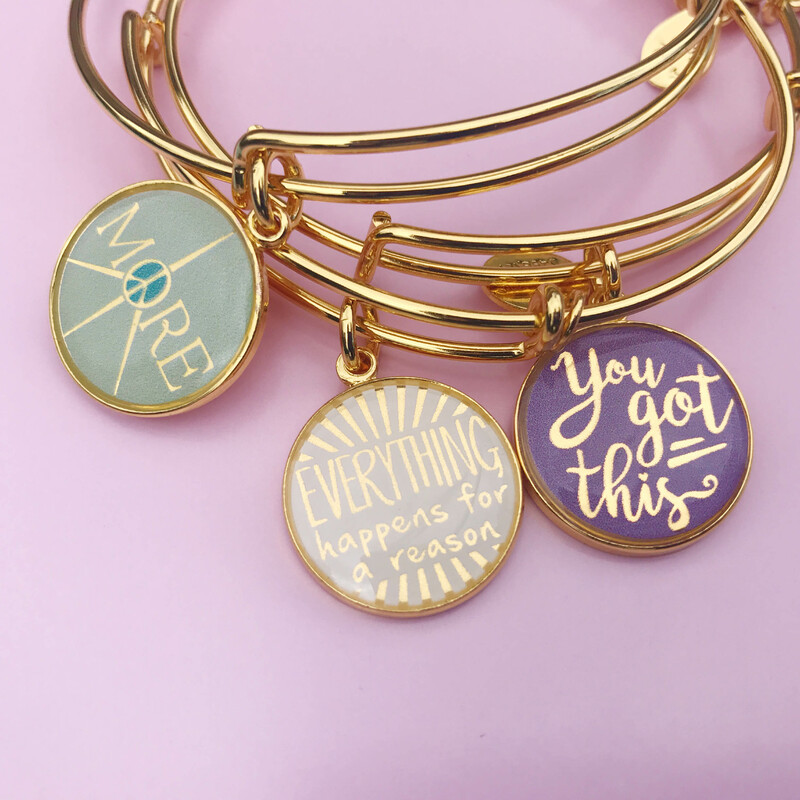 The original blessing bracelet is available in both gold and silver-toned medals and on a variety of colored cords. In addition to the benedictine medal, variations with the cross, miraculous medal, and garment of grace are also available. 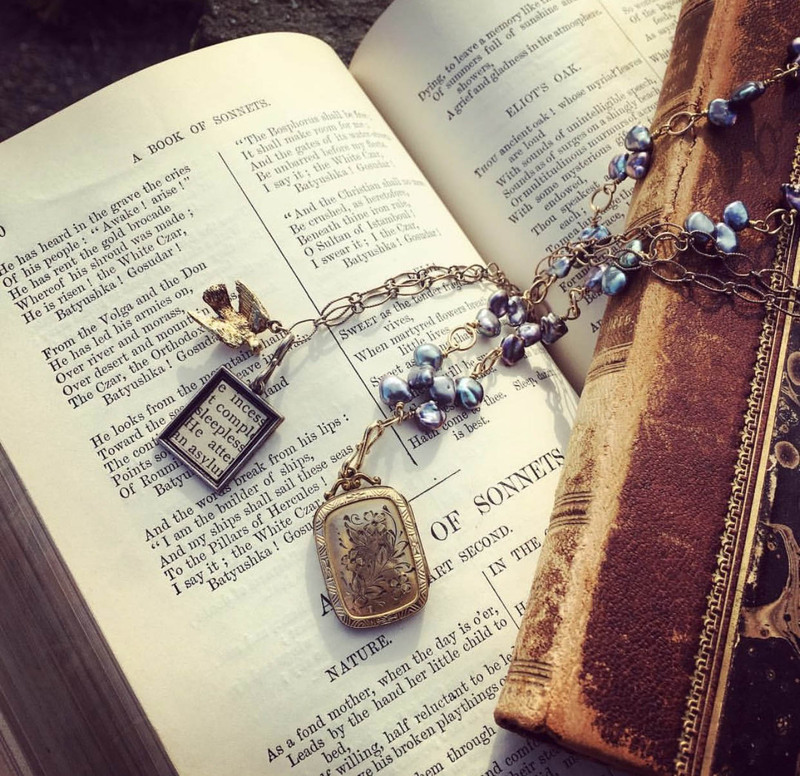 One of our favorites is the new Divine Blessings bracelet, which features a single Benedictine medal surrounded by pearls. Interested in learning more about My Saint My Hero? Stop by Versant to see them in person and learn more about this great collection!